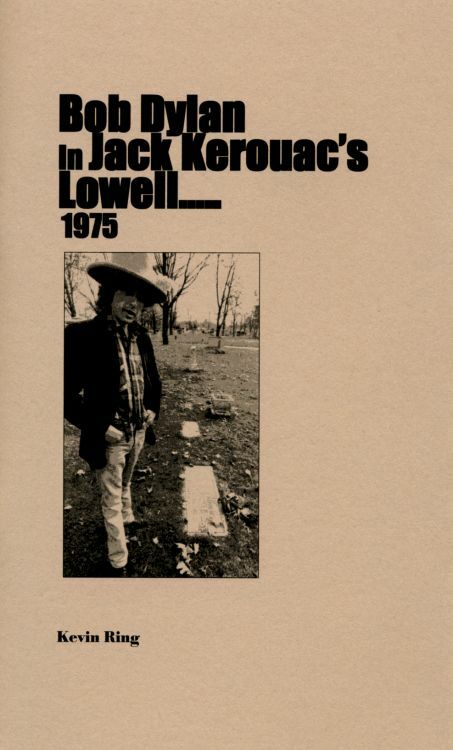 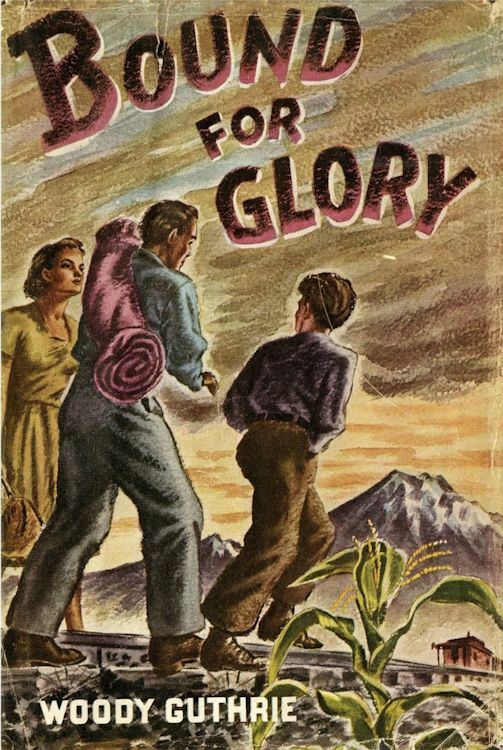 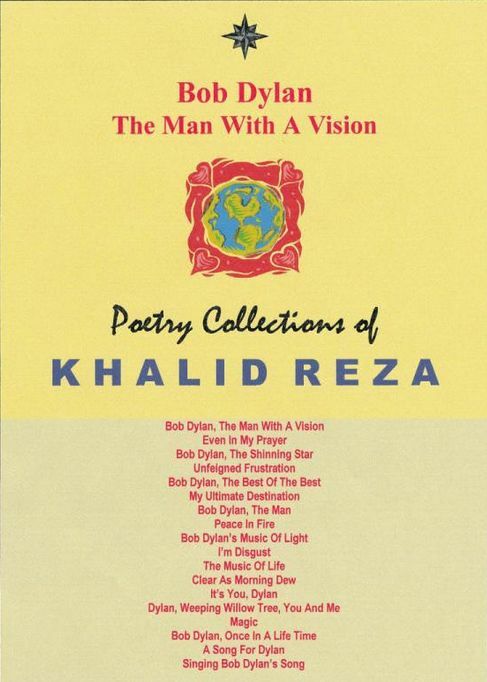 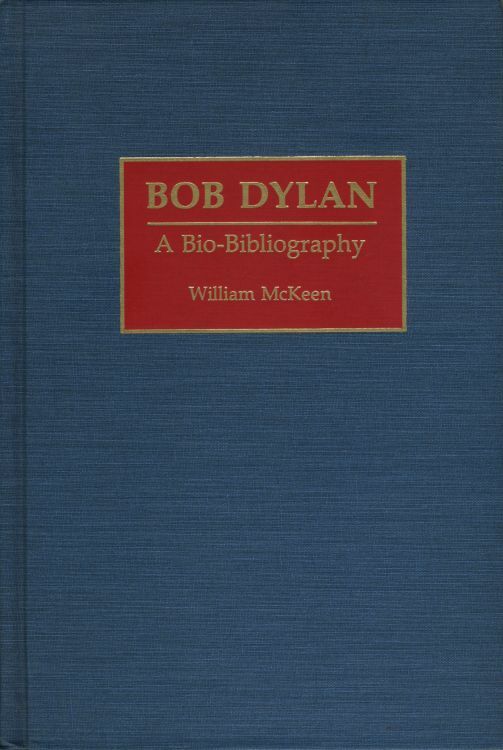 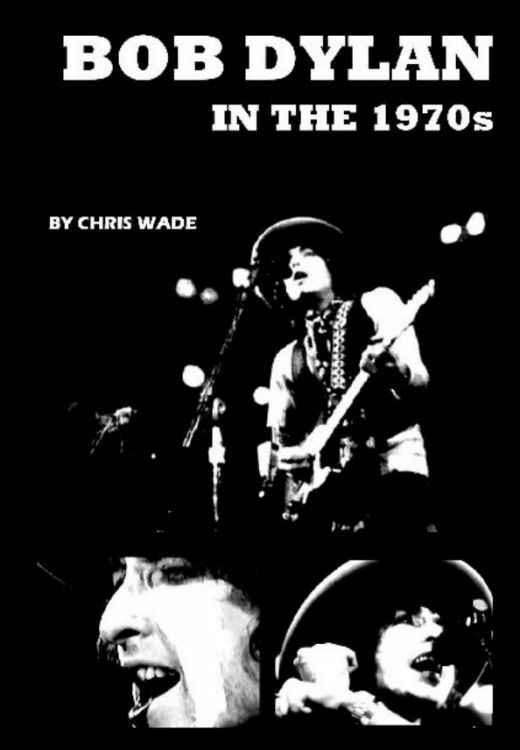 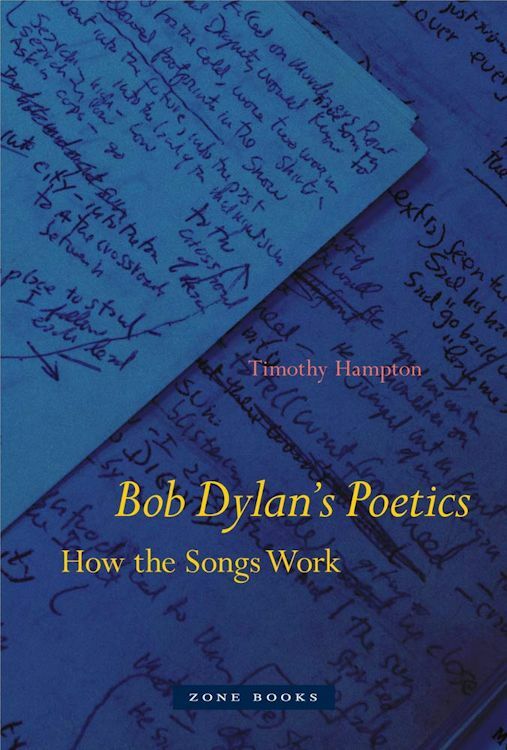 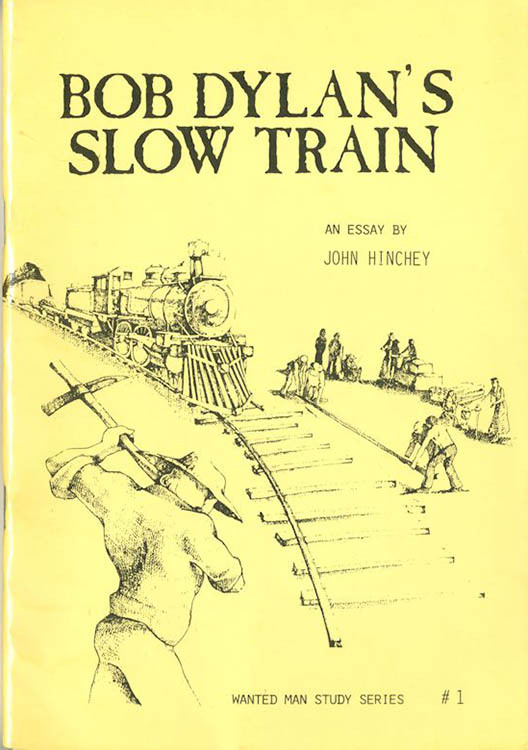 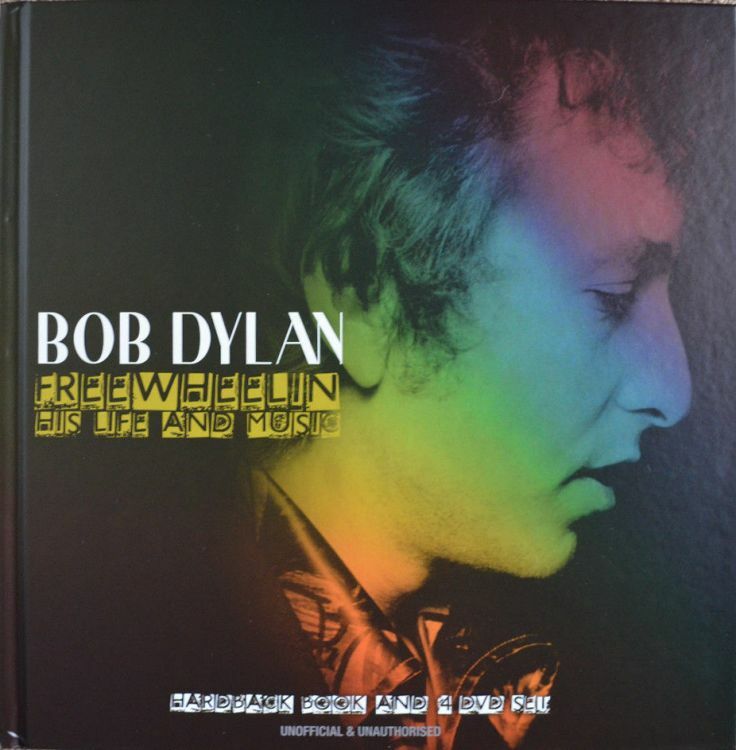 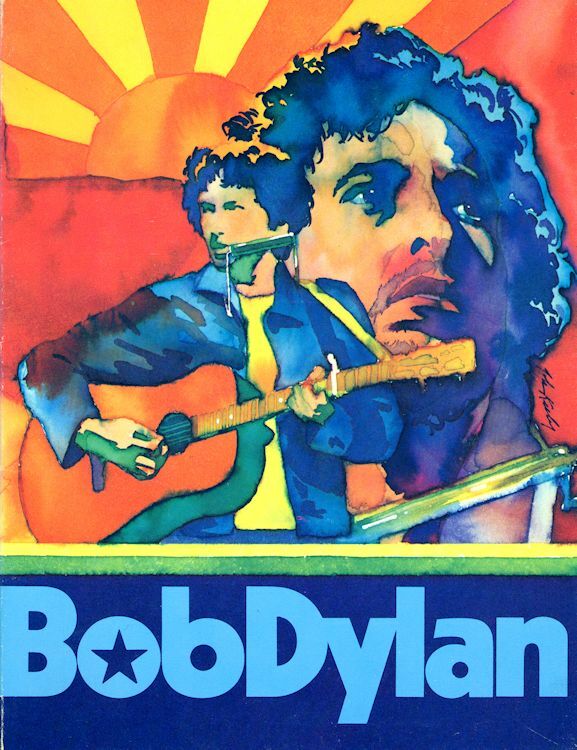 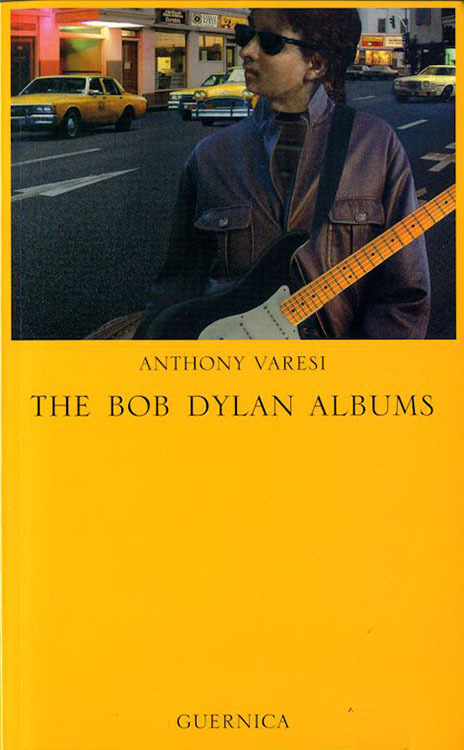 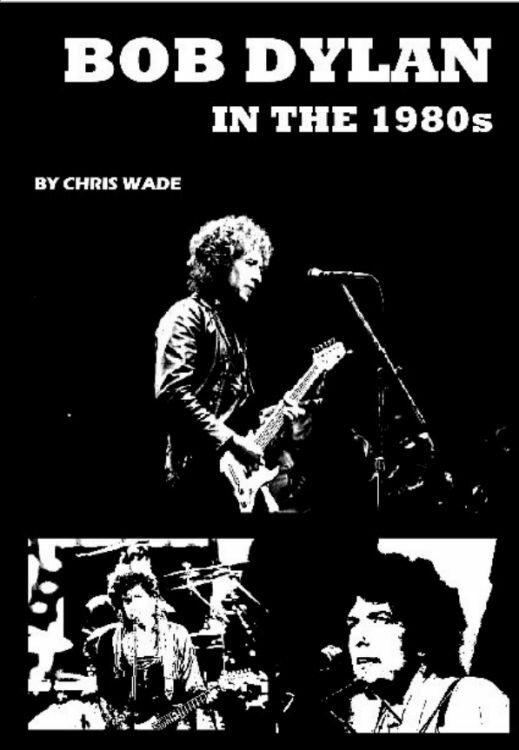 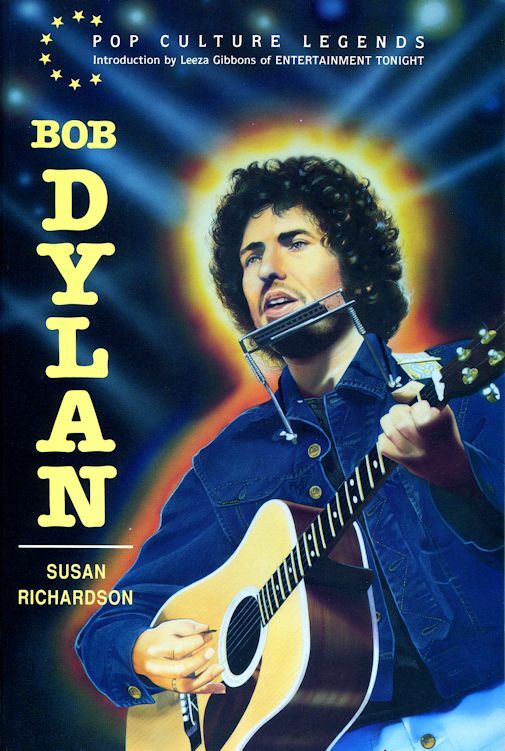 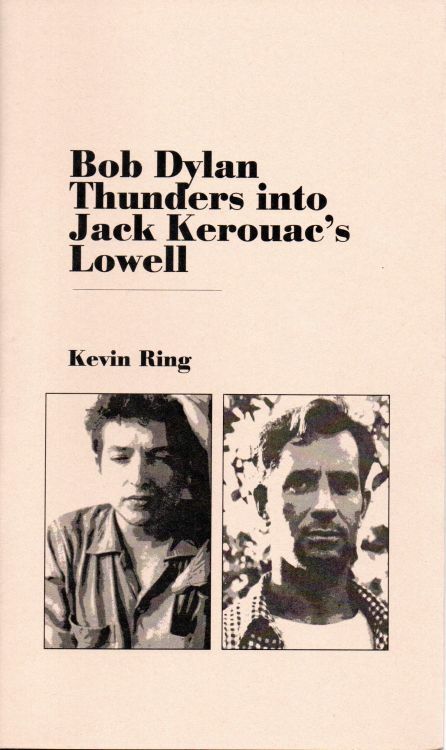 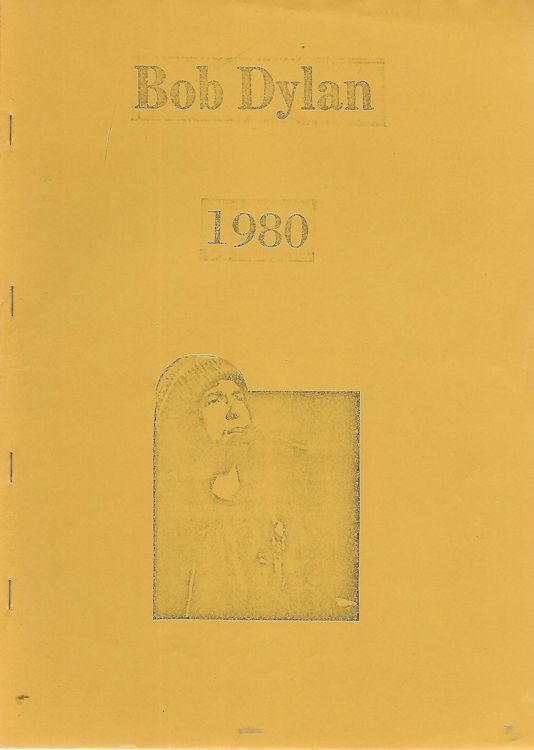 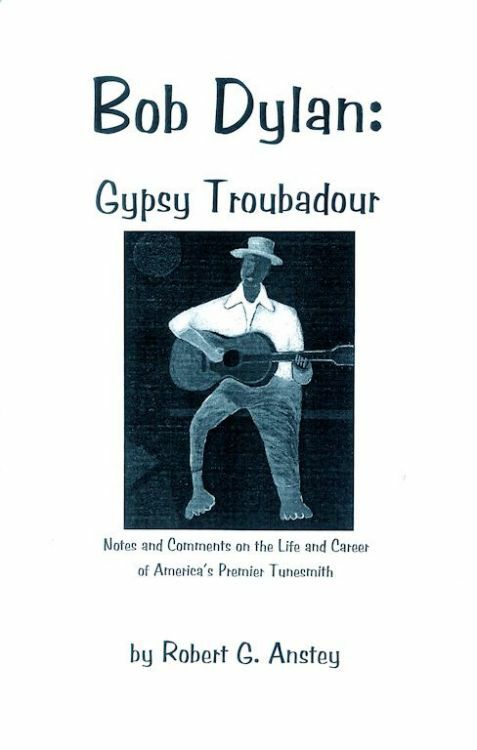 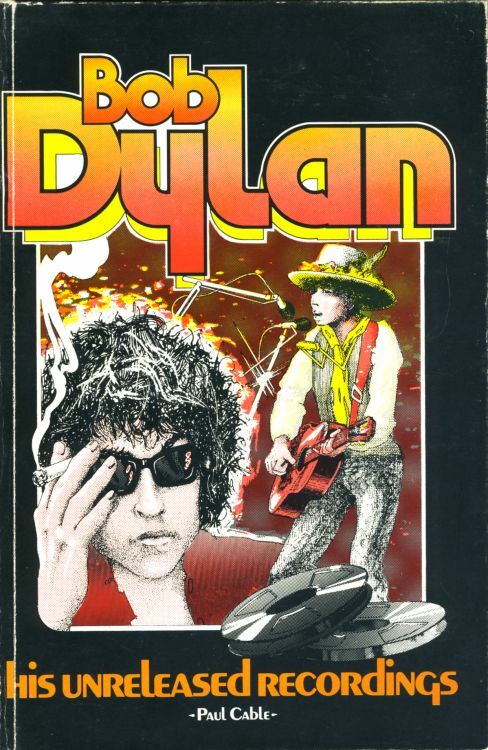 Note: 80% of the books on the website have 'Bob Dylan' printed on the front cover. 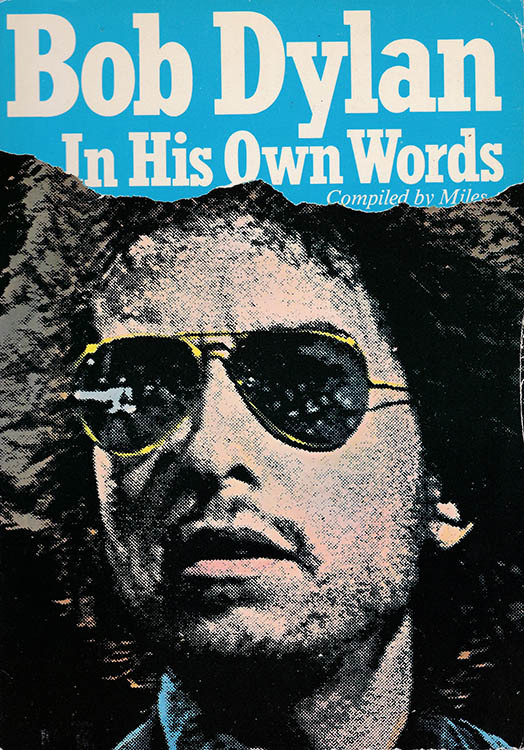 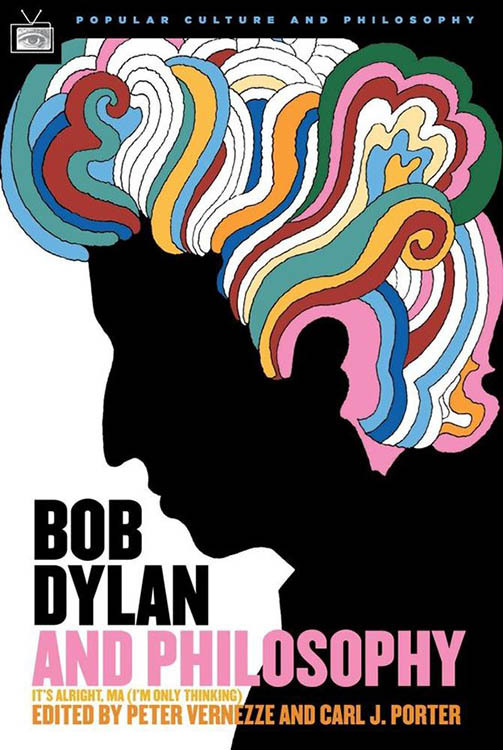 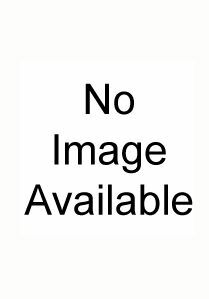 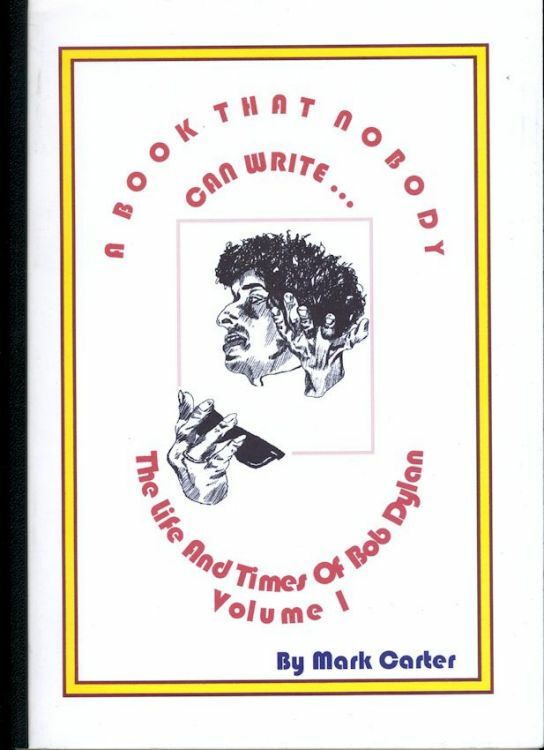 In order to avoid a too long B page, are only listed below the books where 'Bob Dylan' is obviously a part of the title, such as BOB DYLAN IN HIS OWN WORDS. 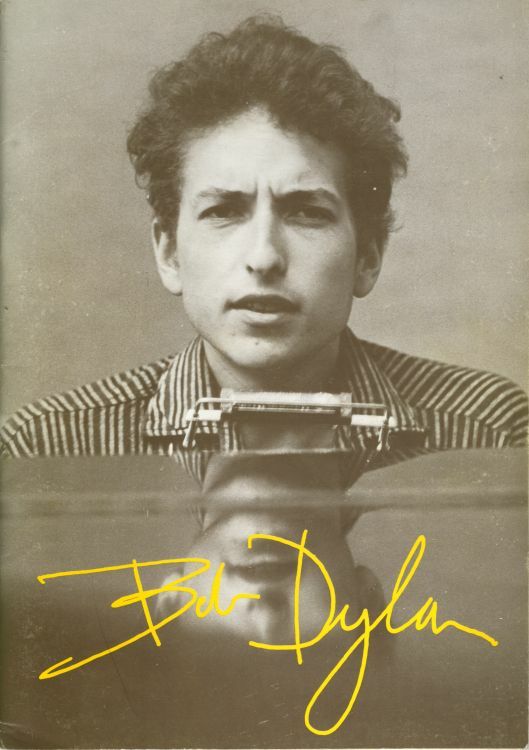 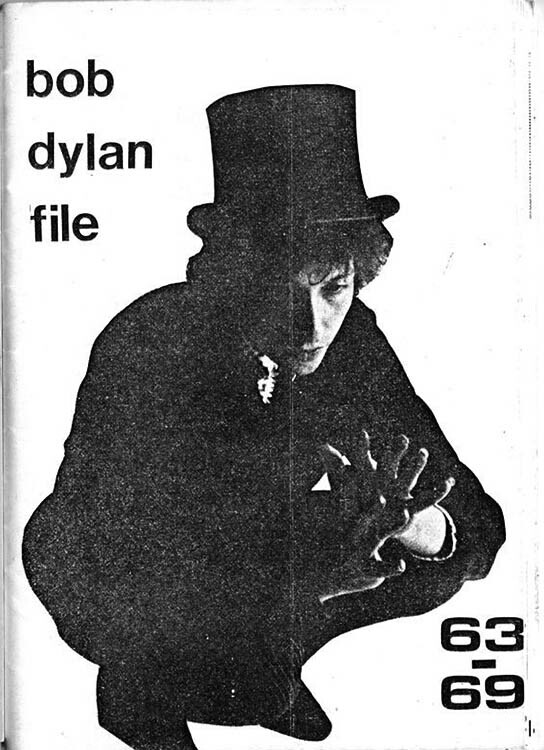 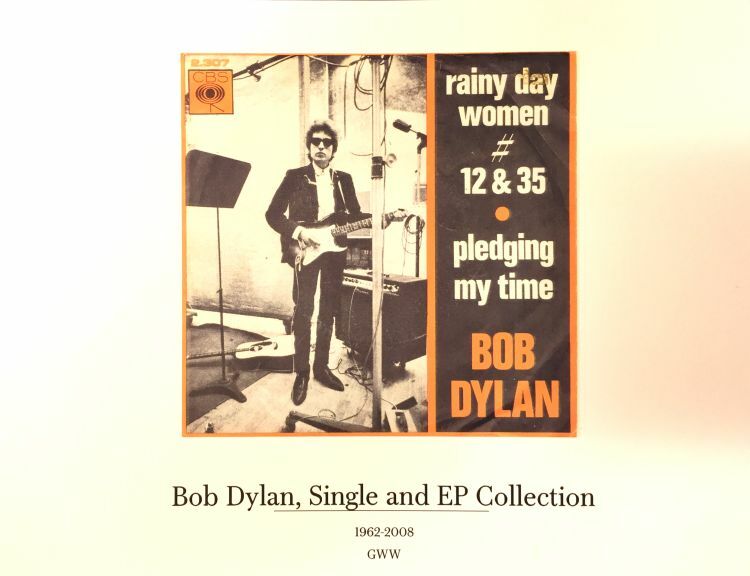 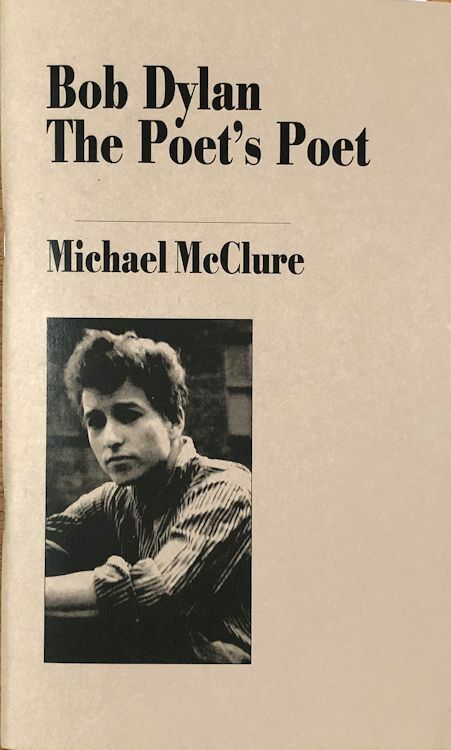 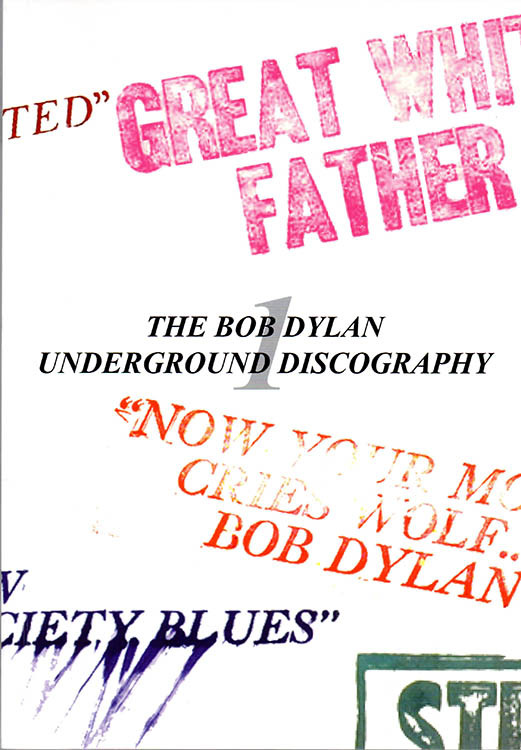 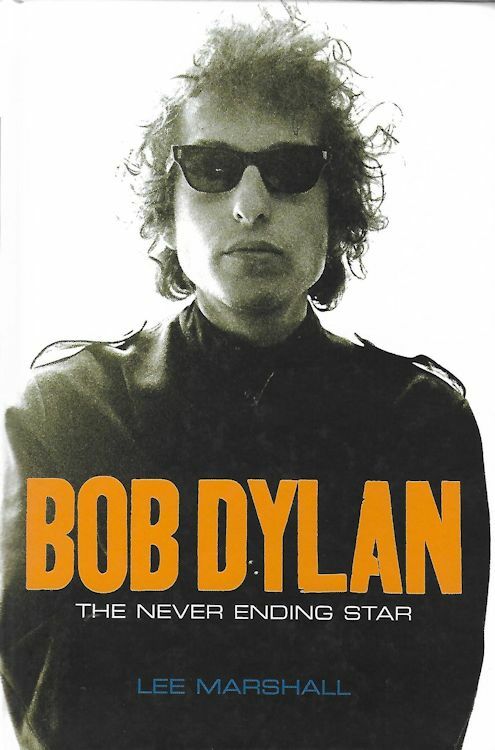 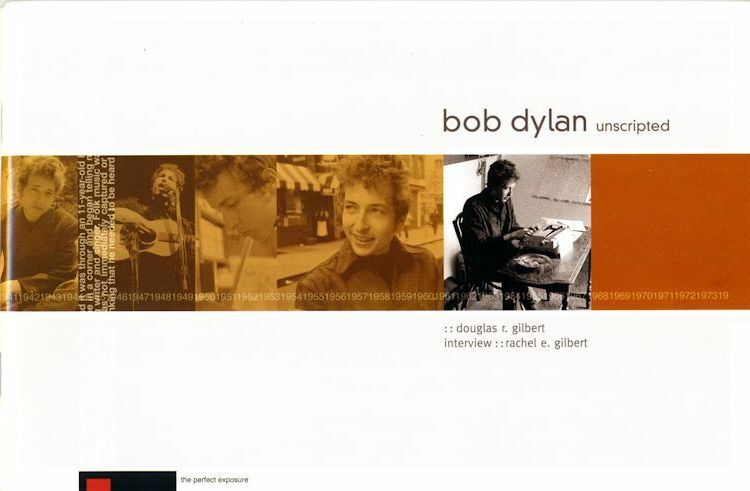 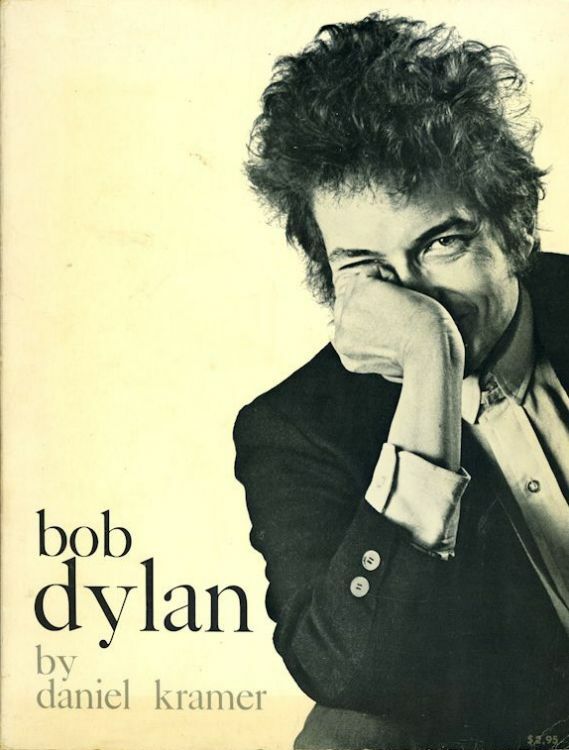 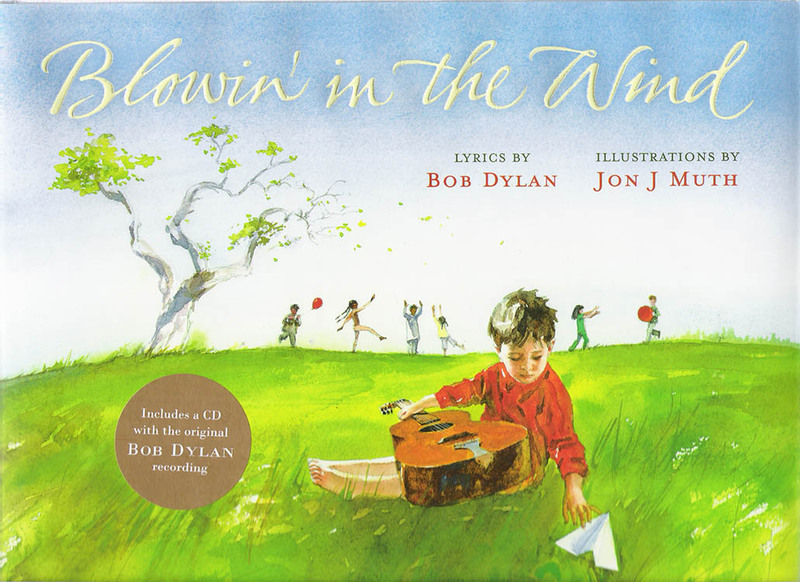 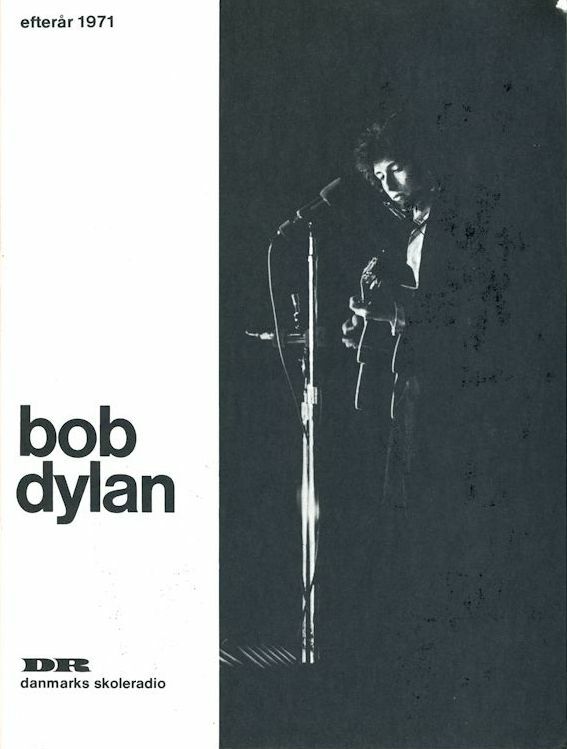 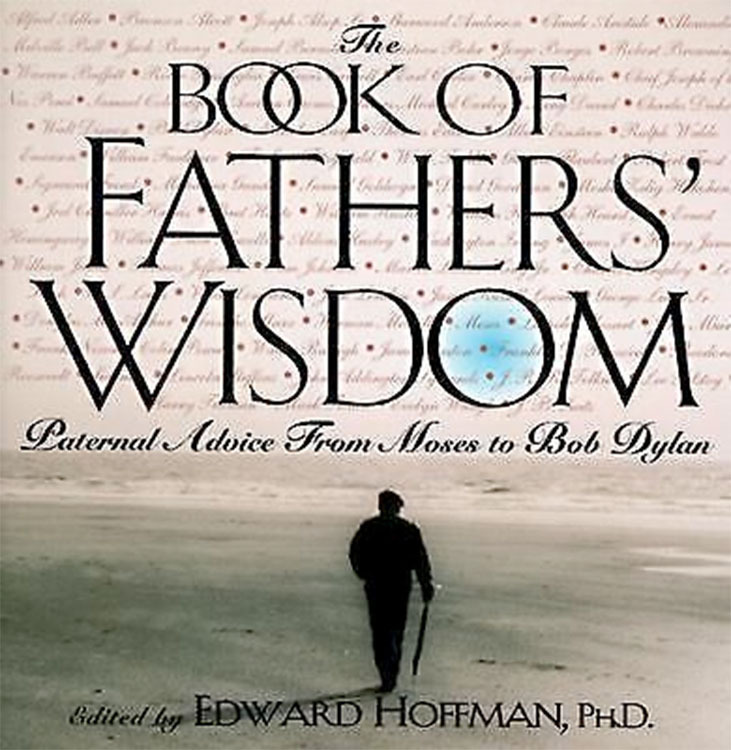 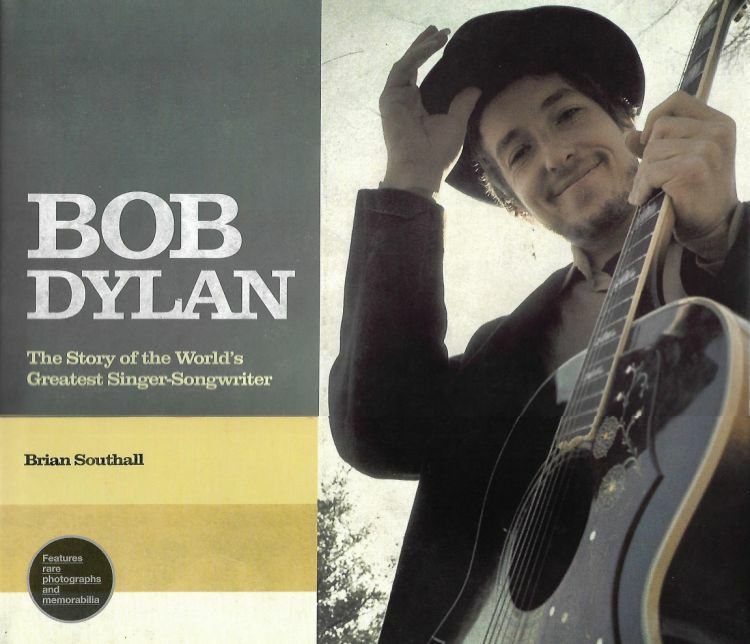 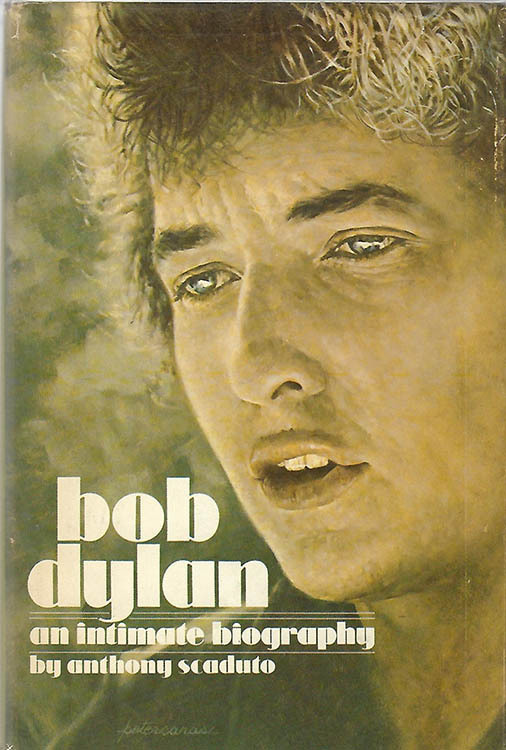 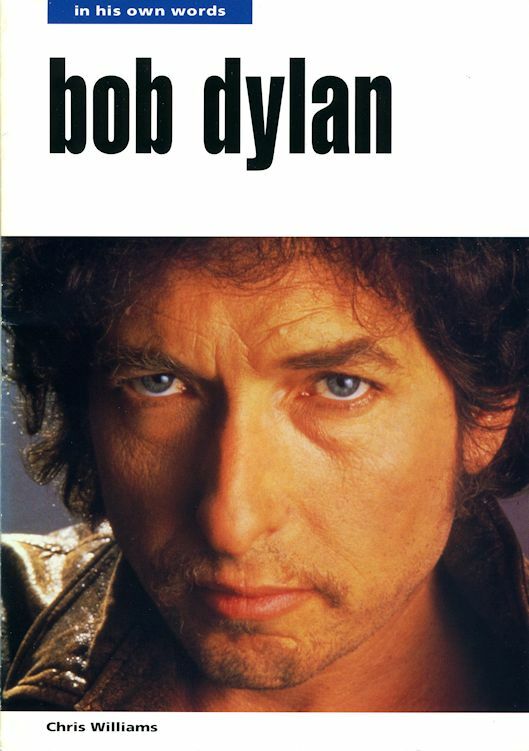 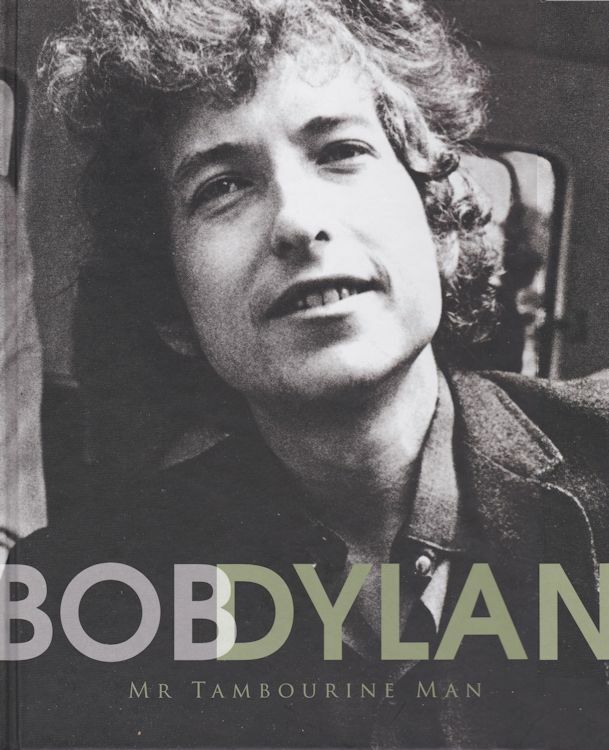 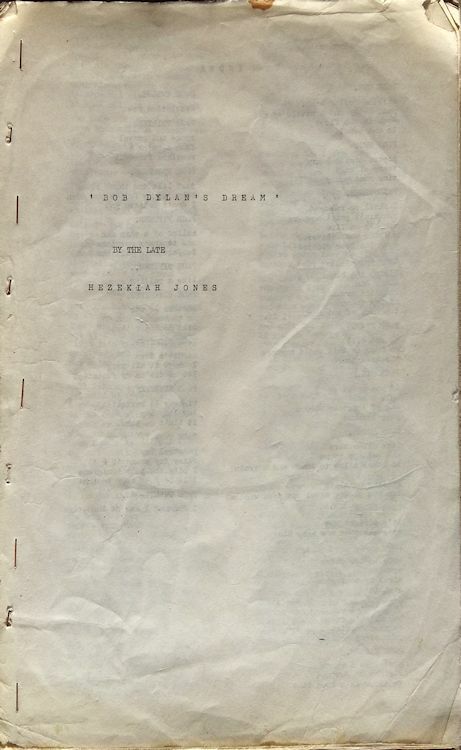 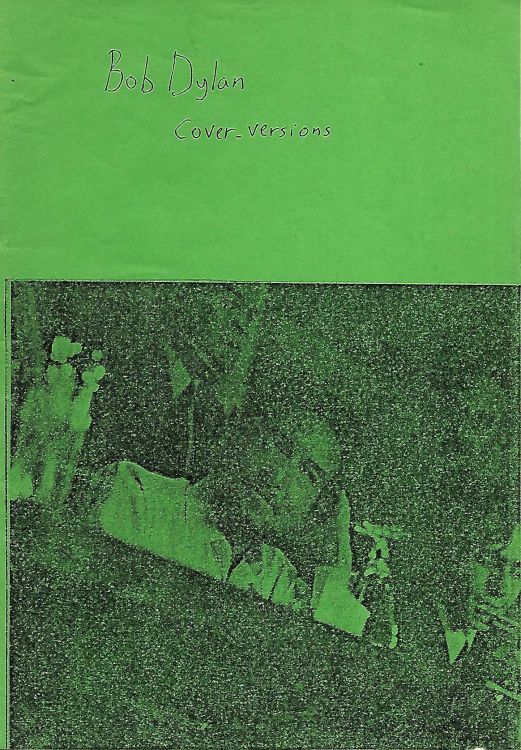 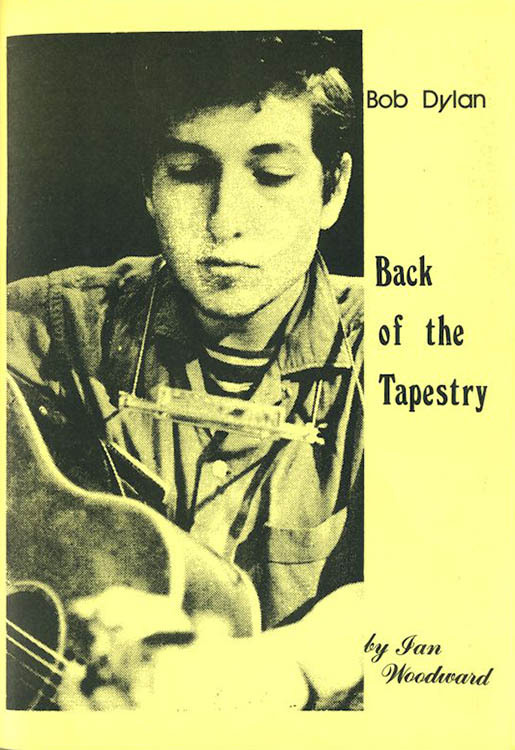 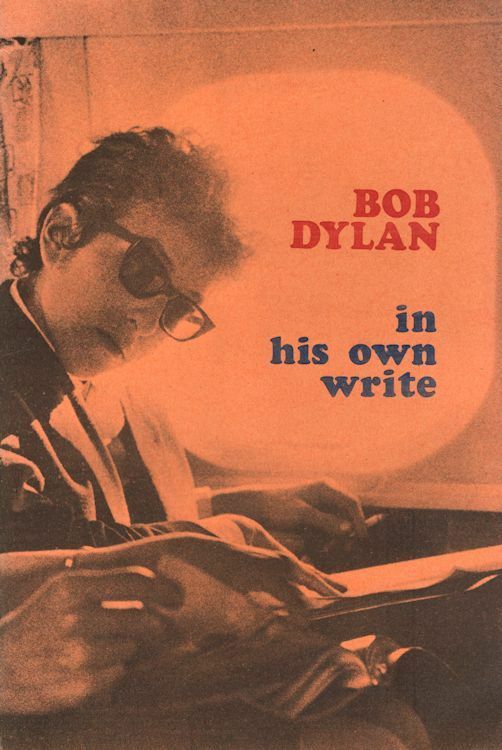 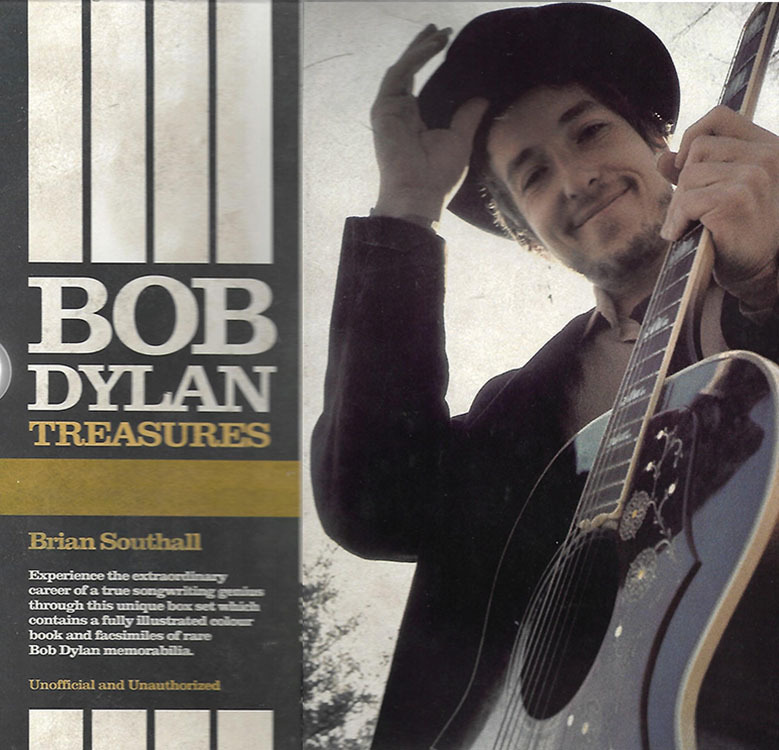 The others, where 'Bob Dylan' is just an indication on the cover, are located on the page of the initial letter of their title: for example MAN IN THE LONG BLACK COAT (BOB DYLAN) is on the M page. 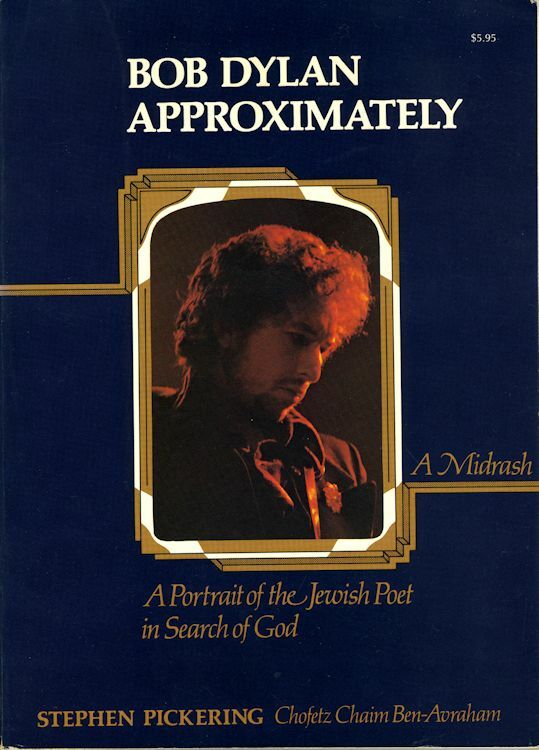 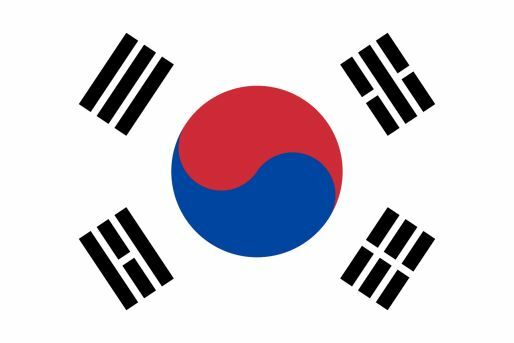 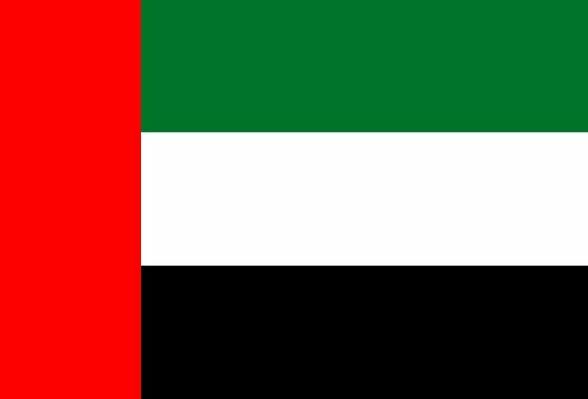 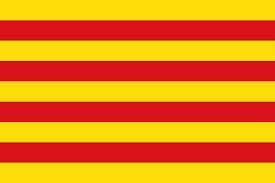 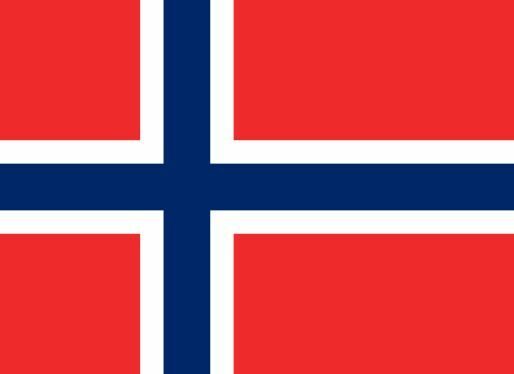 In case of doubt, please use the Search. 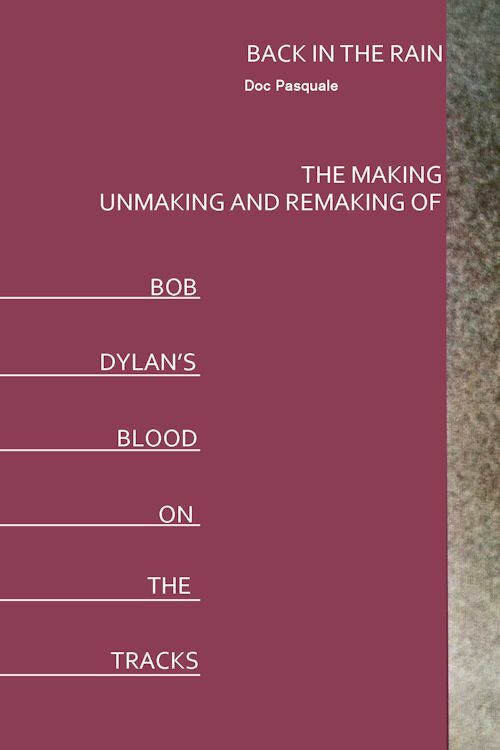 BACK IN THE RAIN - THE MAKING UNMAKING AND REMAKING OF BOB DYLAN'S BLOOD ON THE TRACKS, by Doc Pasquale. 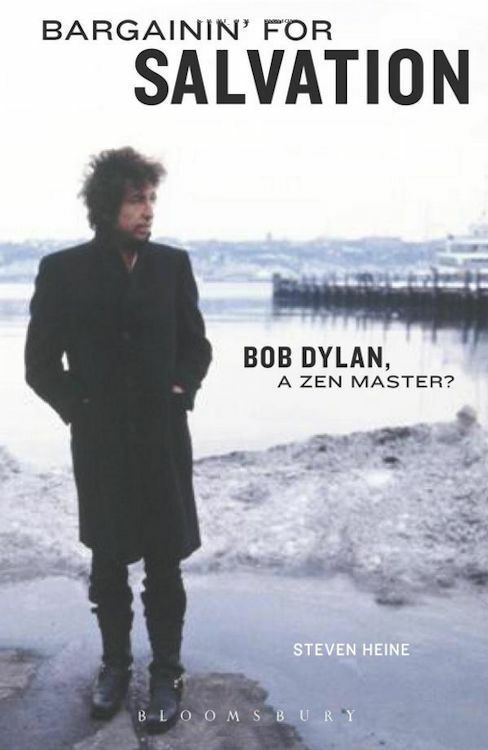 BARGAININ' FOR SALVATION - BOB DYLAN A ZEN MASTER? 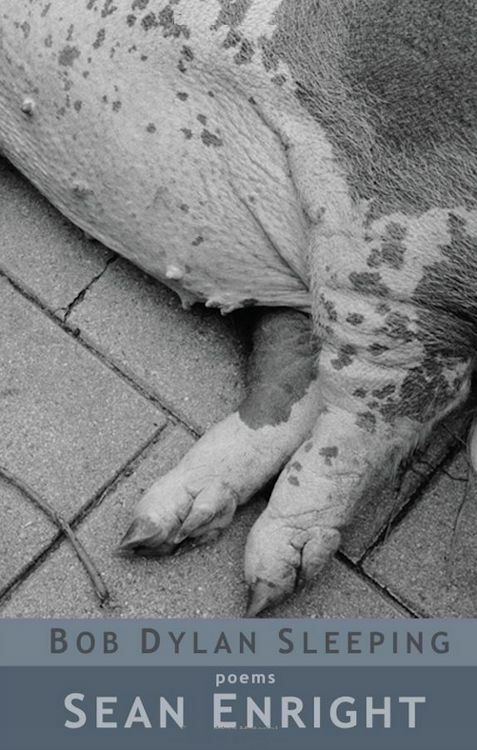 by Steven Heine. 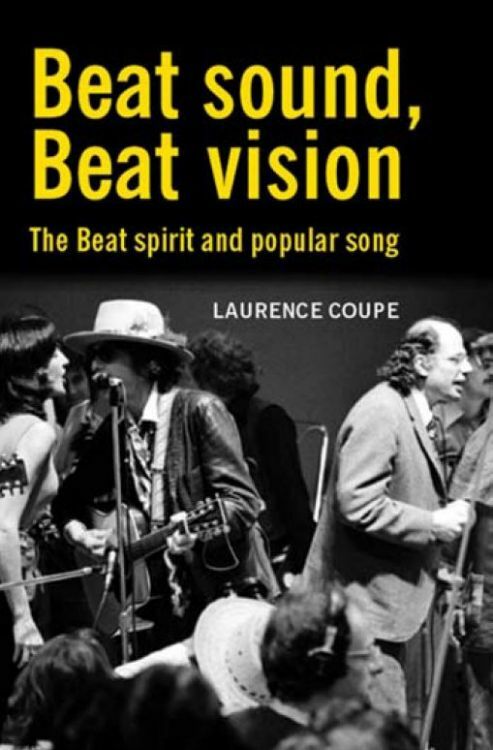 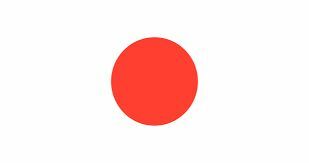 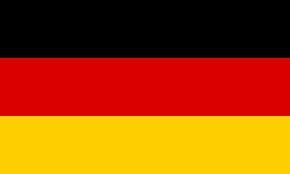 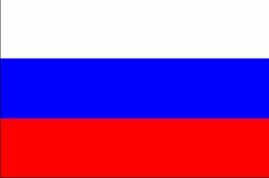 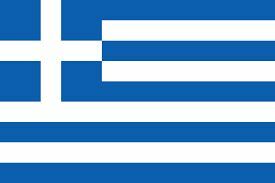 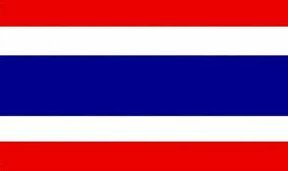 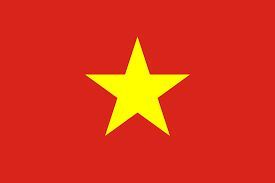 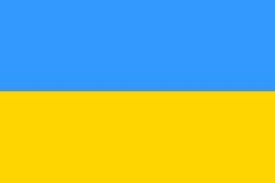 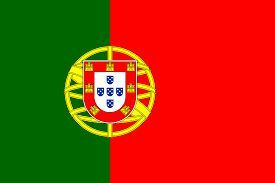 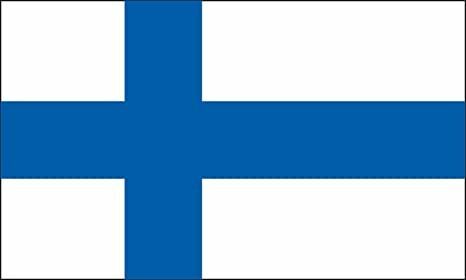 * BEAT SOUND, BEAT VISION - THE BEAT SPIRIT AND POPULAR SONG, by Laurence Coupe. 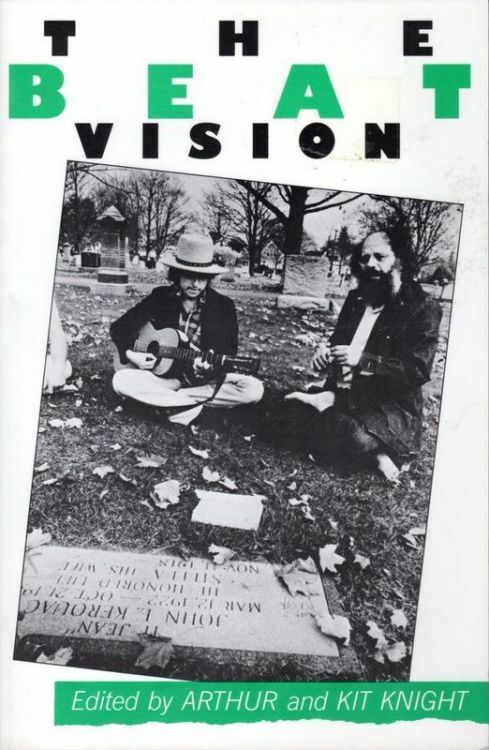 * BEAT VISION (THE), by Arthur and Kit Knight. 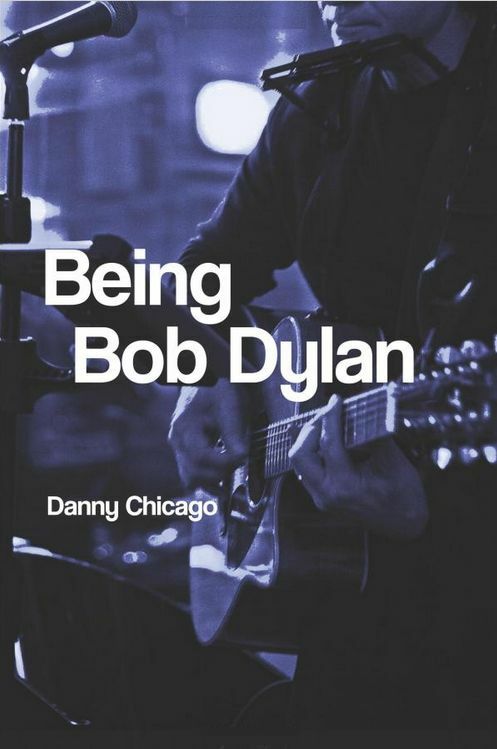 BEING BOB DYLAN, by Danny Chicago. 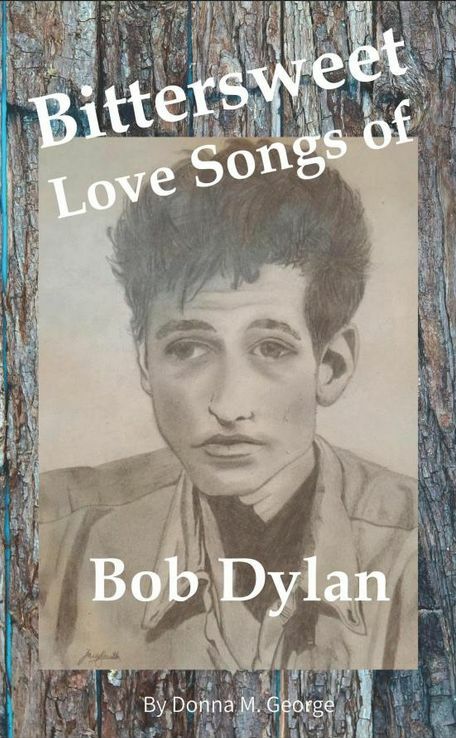 BITTERSWEET LOVE SONGS OF BOB DYLAN, by Donna M. George. 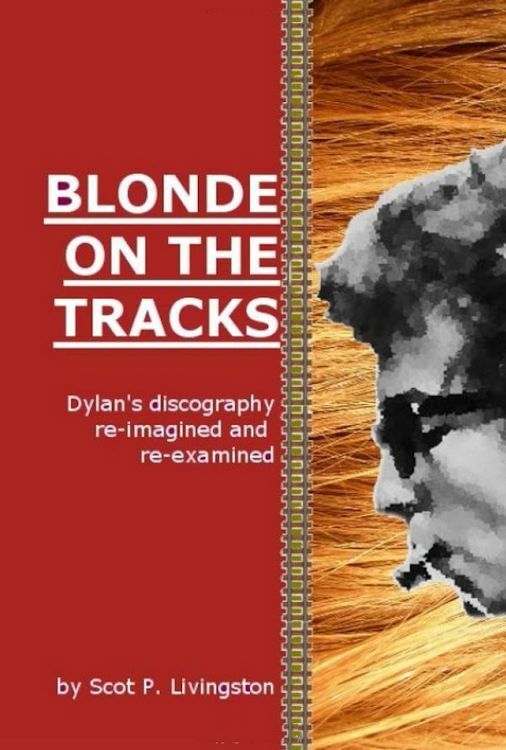 BLONDE ON THE TRACKS, by Scot P. Livingston. 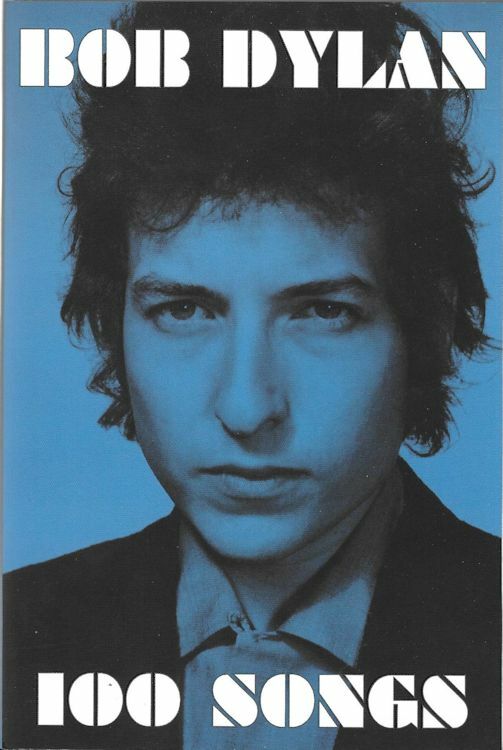 BOB DYLAN, by Karen Beggs. 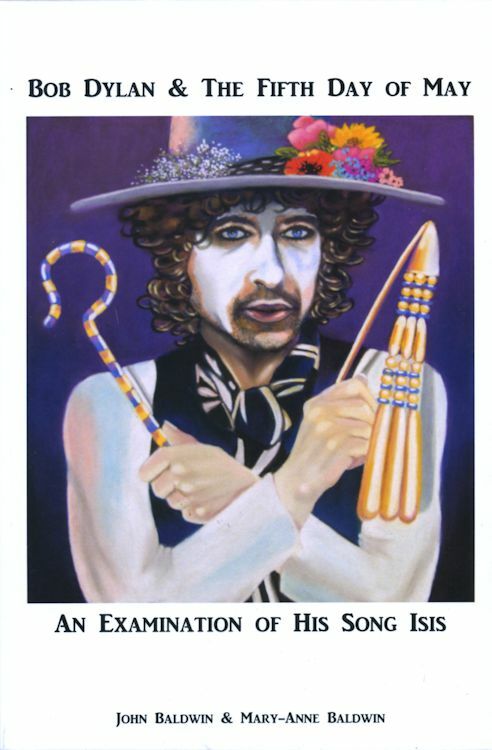 BOB DYLAN, by Jeff Perkins. 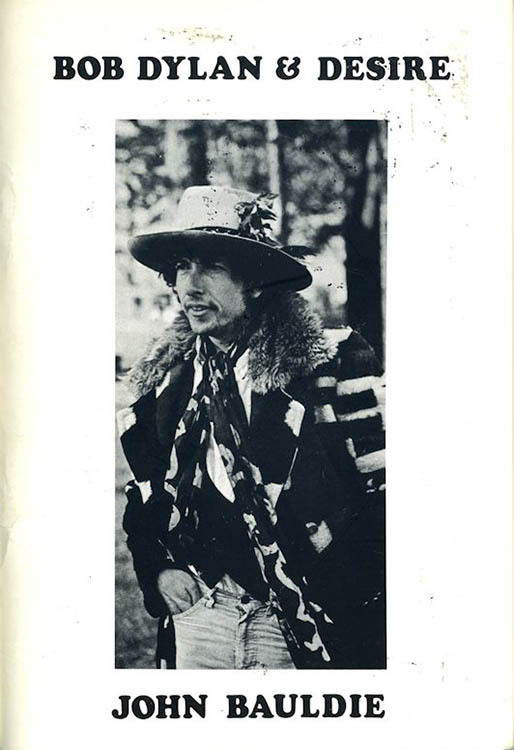 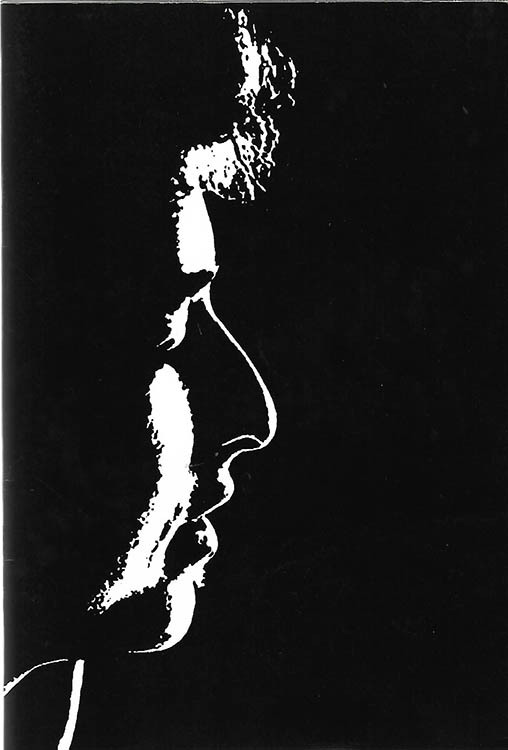 BOB DYLAN, by Charles River Editors. 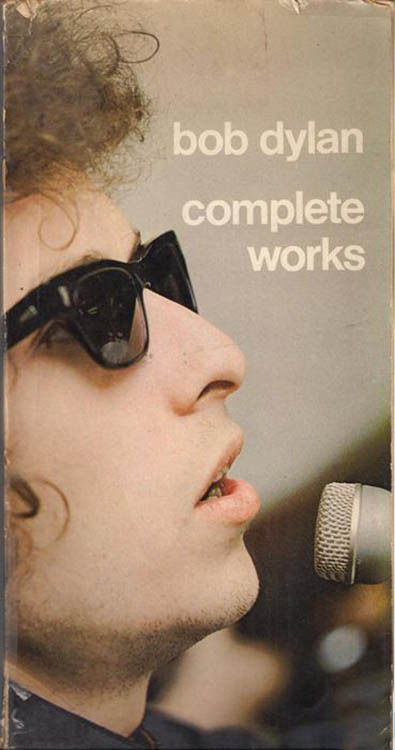 BOB DYLAN, by Alan Stevenson. 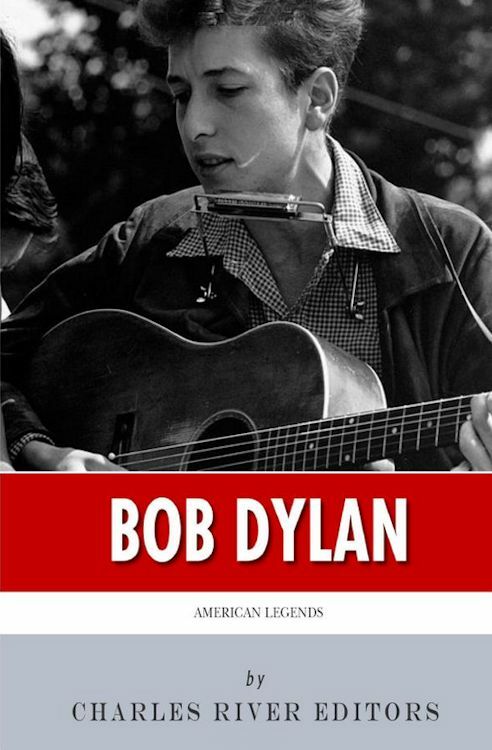 BOB DYLAN - BIOGRAPHY, by Bob Batchelor. 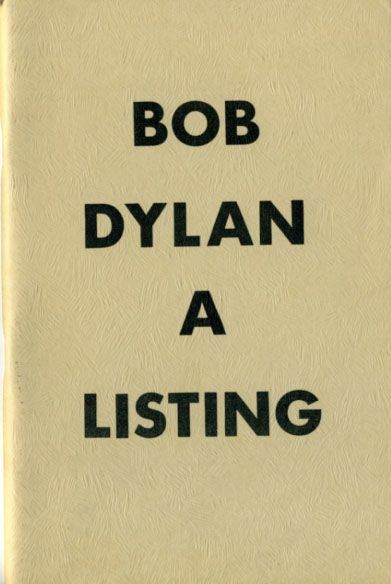 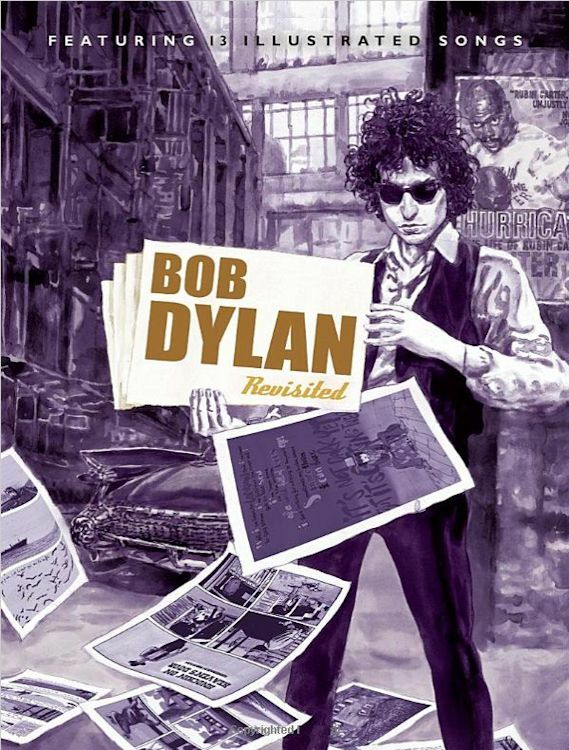 BOB DYLAN - A LISTING, by Keith Wilson. 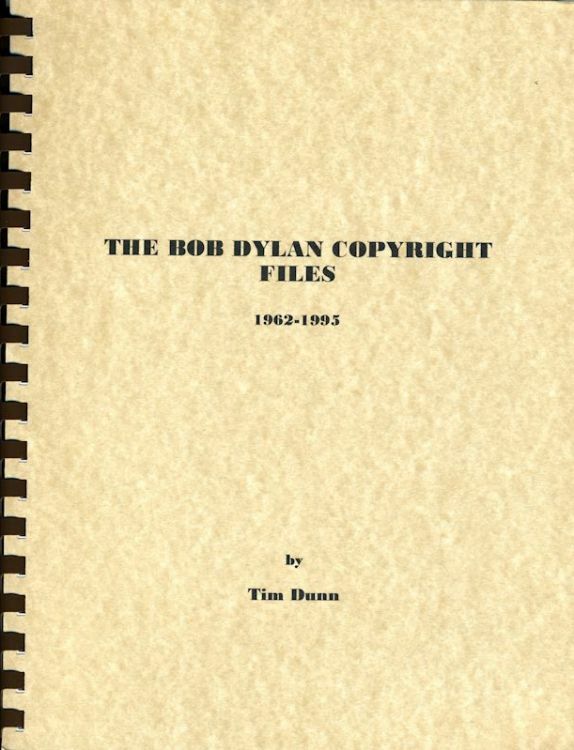 BOB DYLAN ALBUM FILE & COMPLETE DISCOGRAPHY, by Brian Hinton. 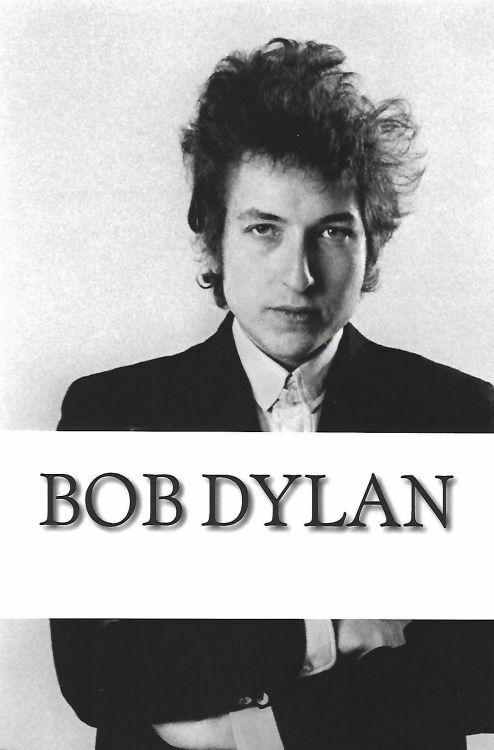 BOB DYLAN ALBUMS (THE), by Anthony Varesi. 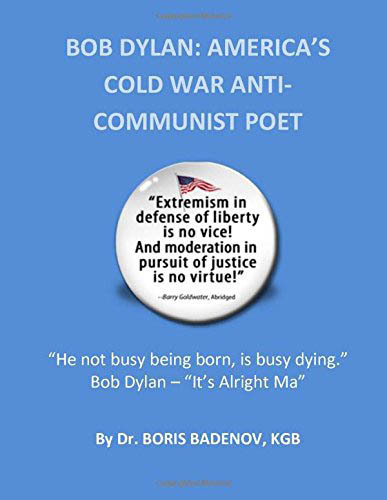 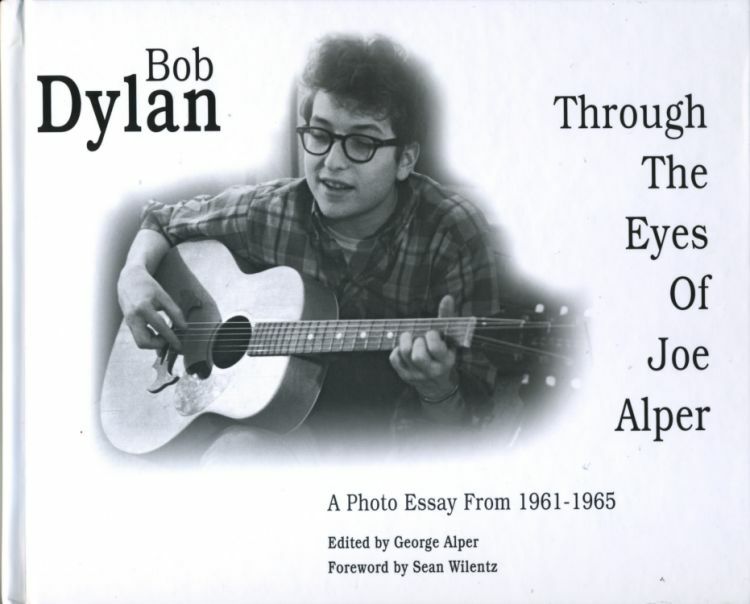 BOB DYLAN: AMERICA'S COLD WAR ANTI-COMMUNIST POET, by A.J. 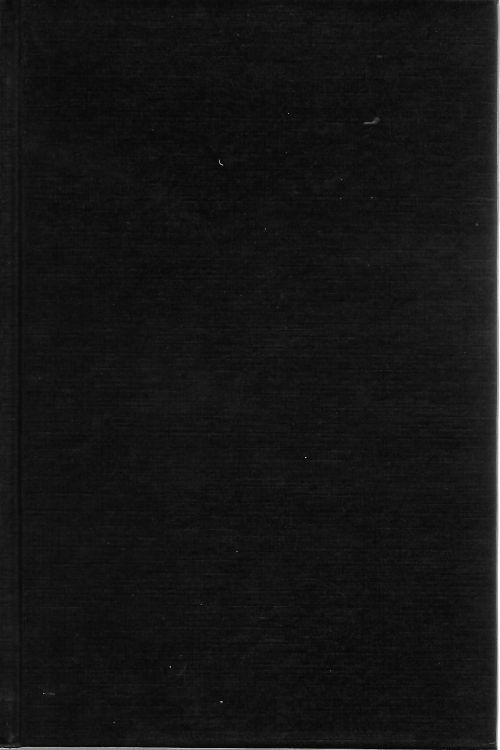 Weberman. 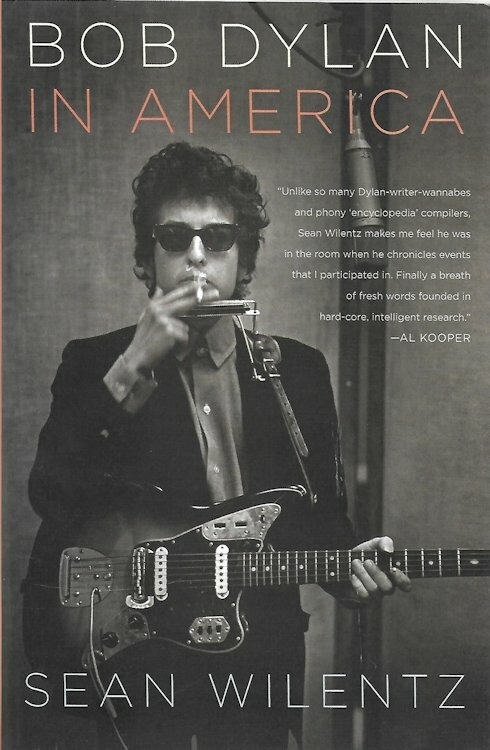 BOB DYLAN - AMERICAN POET AND SINGER by Richard Wissolik. 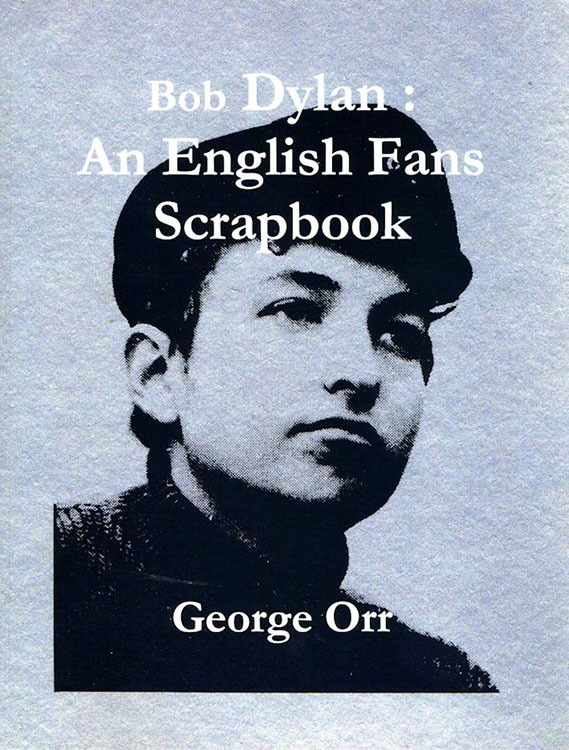 BOB DYLAN: AN ENGLISH FAN'S SCRAPBOOK, by George Orr. 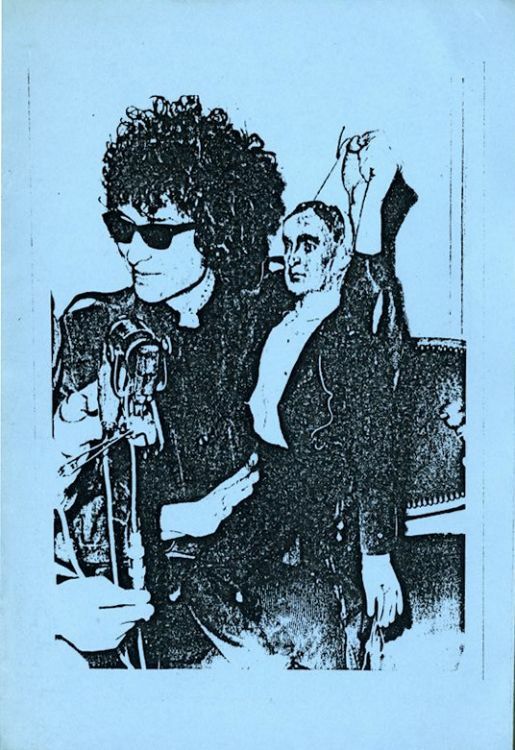 BOB DYLAN & DESIRE, by John Bauldie. 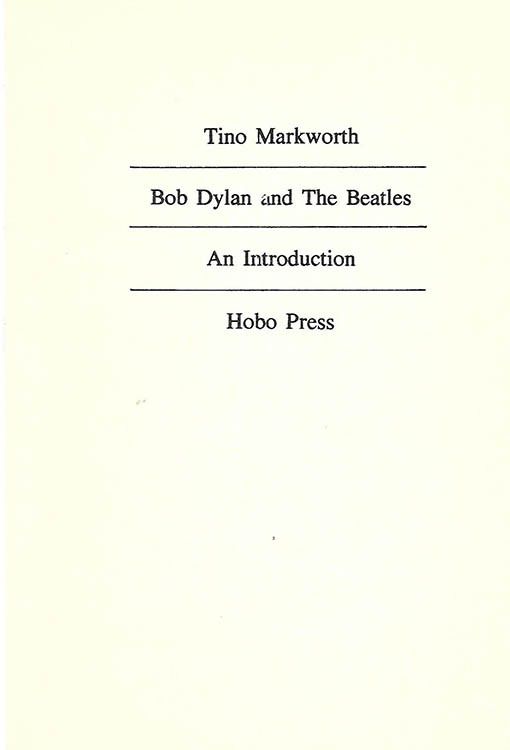 BOB DYLAN AND THE BEATLES - AN INTRODUCTION, by Tino Markworth. 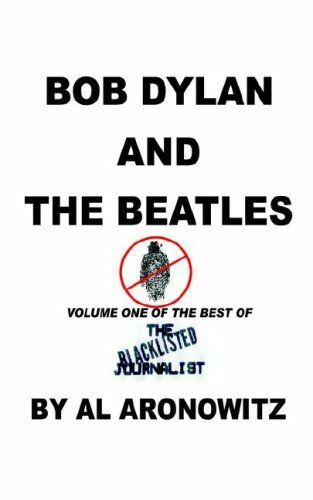 BOB DYLAN AND THE BEATLES, VOLUME ONE OF THE BEST OF THE BLACKLISTED JOURNALIST, by Al Aronowitz. 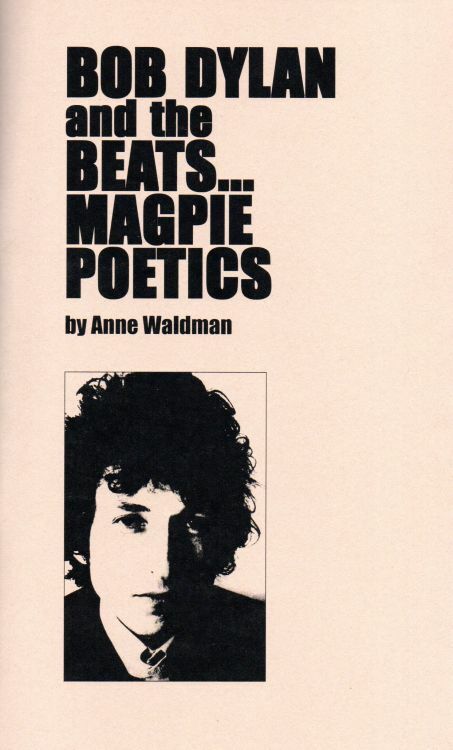 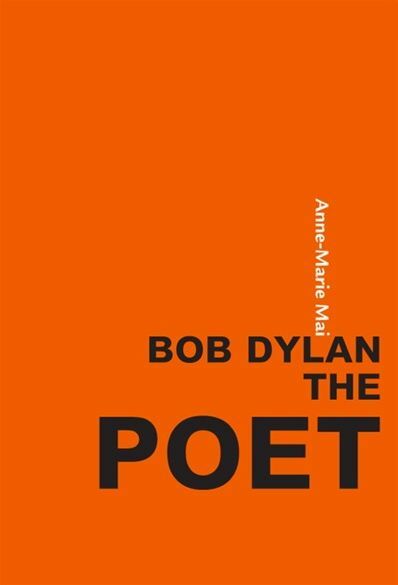 BOB DYLAN AND THE BEATS... MAGPIE POETICS, by Anne Waldman. 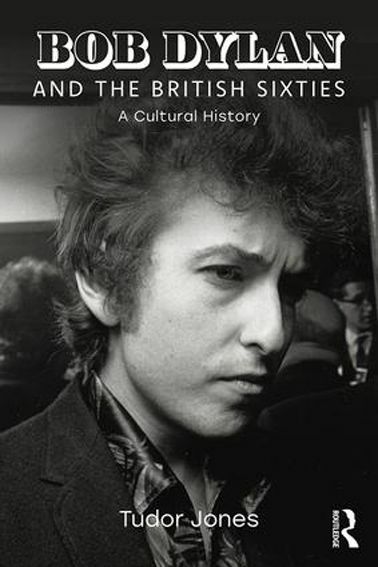 BOB DYLAN AND THE BRITISH SIXTIES - A CULTURAL HISTORY, by Tudor Jones. 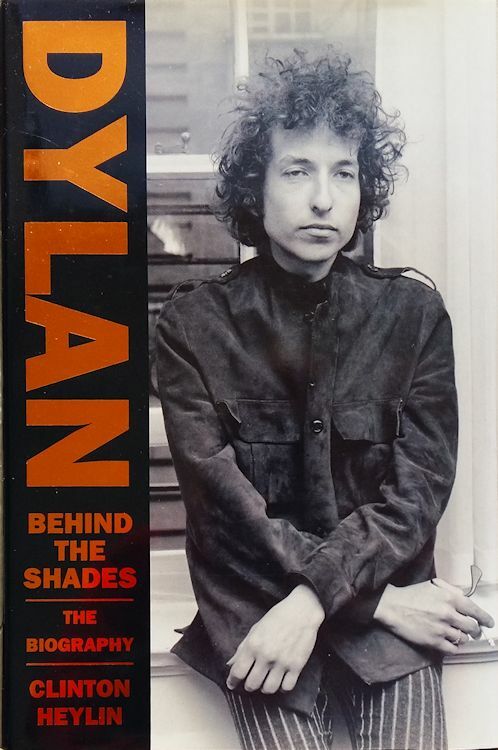 BOB DYLAN AND THE CARDS, by Walter Van der Paelt. 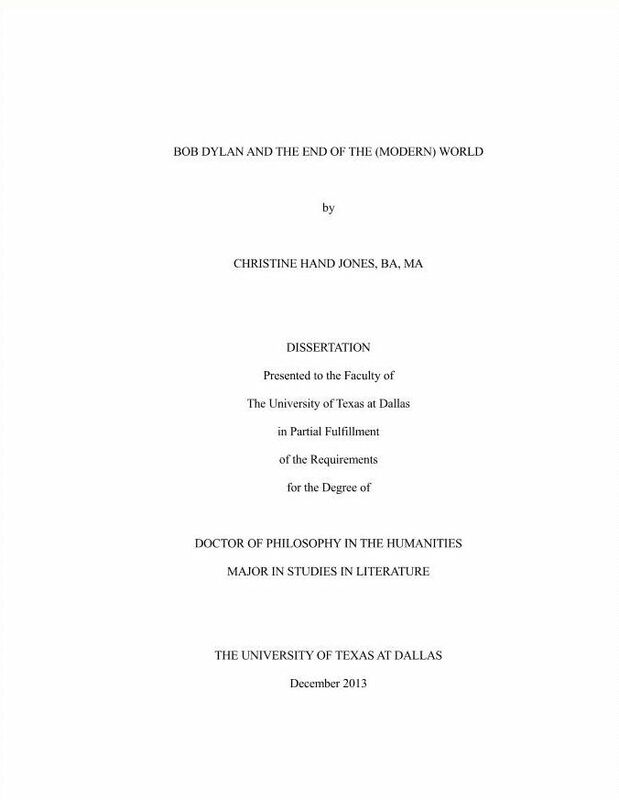 BOB DYLAN AND THE END OF THE (MODERN) WORLD, by Christine Hand. 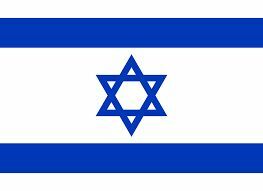 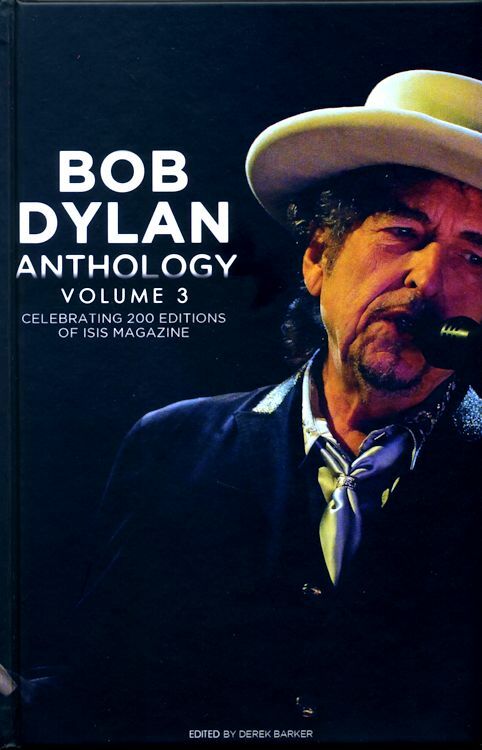 BOB DYLAN & THE FIFTH DAY OF MAY - AN EXAMINATION OF HIS SONG ISIS, by John Baldwin and Mary-Anne Baldwin. 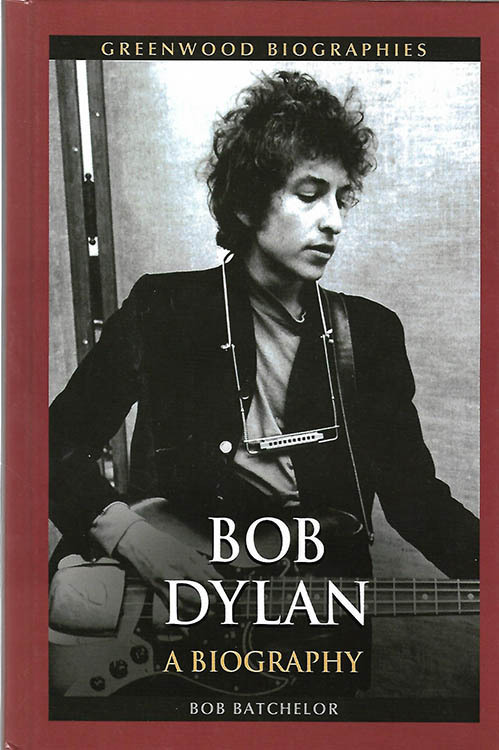 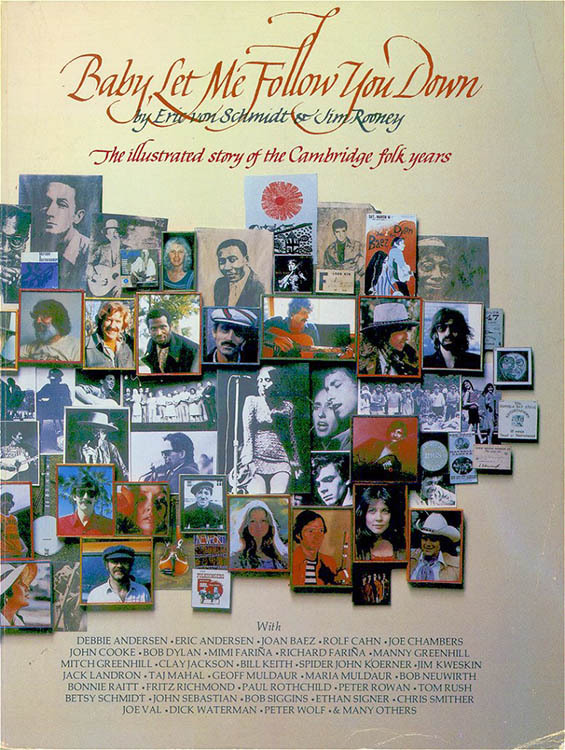 BOB DYLAN ANTHOLOGY VOLUME 3, edited by Derek Barker. 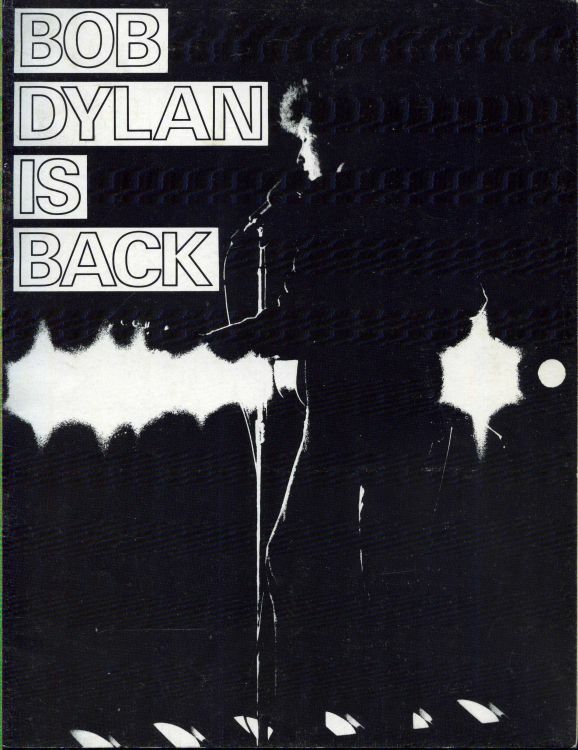 BOB DYLAN AUDIO TAPES (AND DECEMBER 1989 UPDATE). 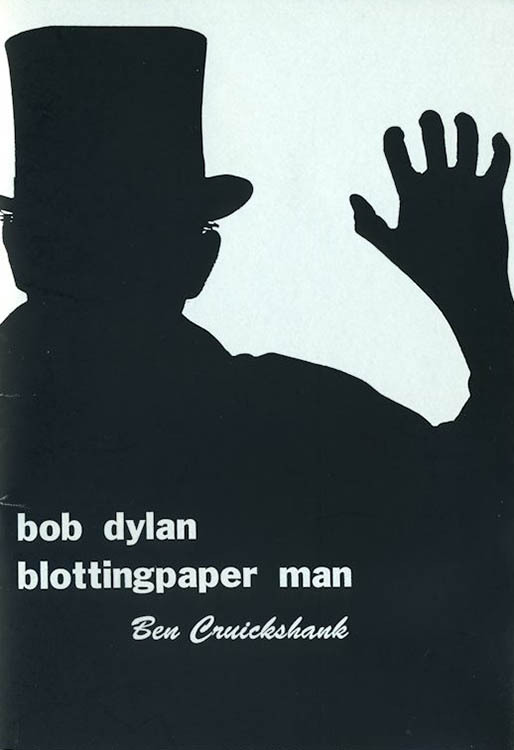 Private publication. .
BOB DYLAN BLOTTINGPAPER MAN, by Ben Cruickshank. 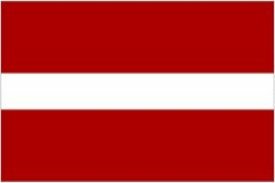 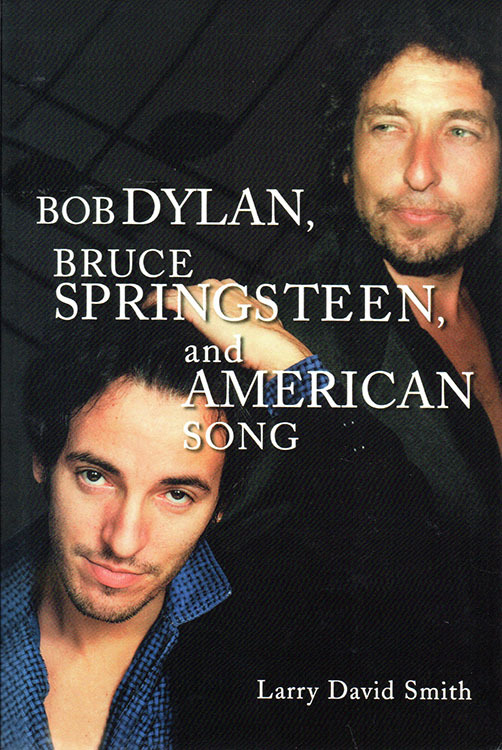 BOB DYLAN, BRUCE SPRINGSTEEN AND AMERICAN SONG, by Larry David Smith. 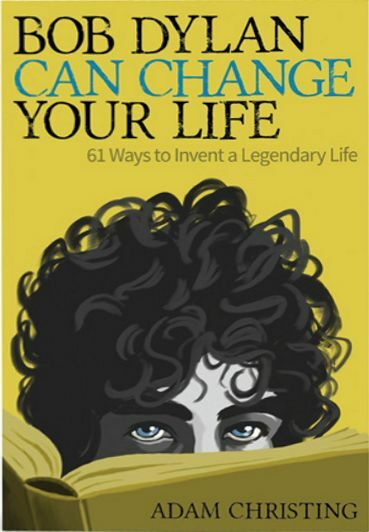 BOB DYLAN CAN CHANGE YOUR LIFE - 61 WAYS TO INVENT A LEGENDARY LIFE, by Adam Christing. 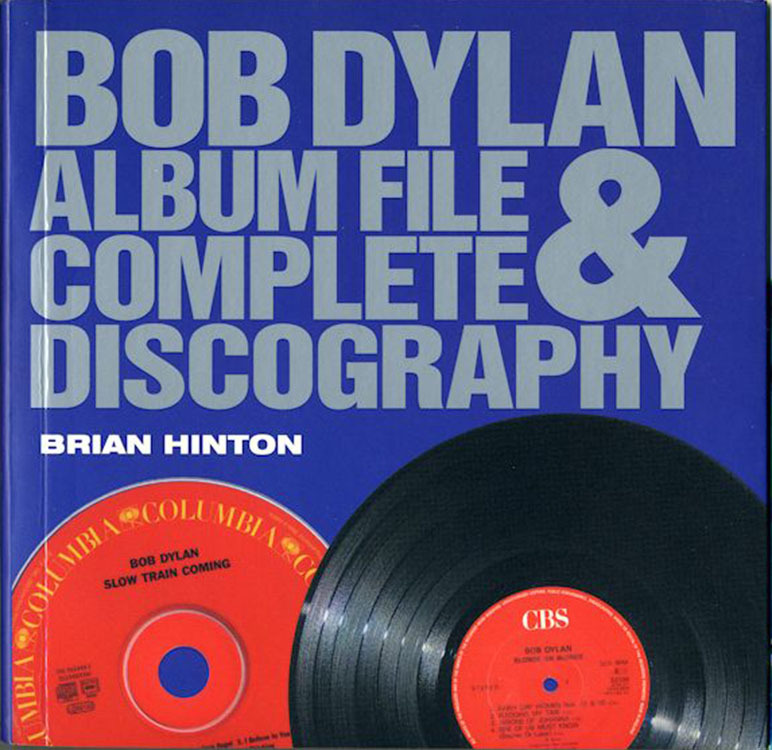 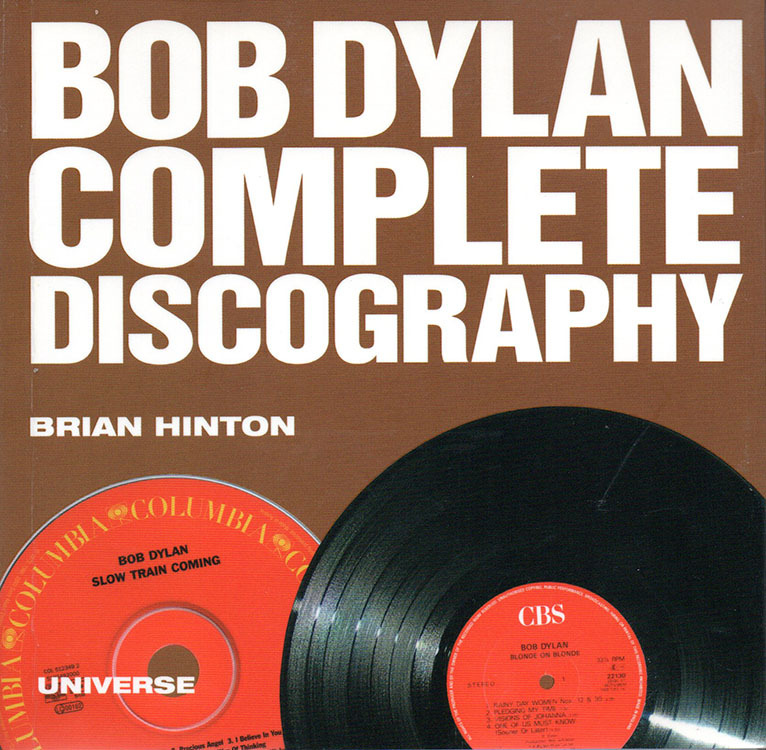 BOB DYLAN COMPLETE DISCOGRAPHY, by Brian Hinton. 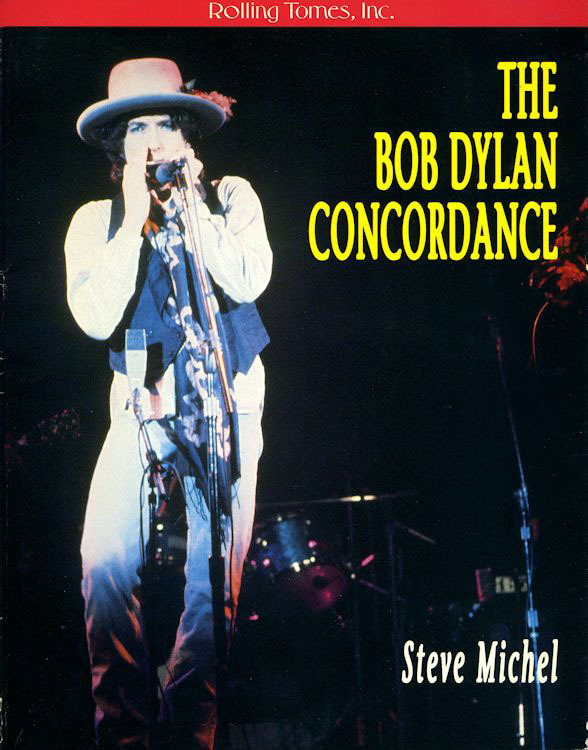 BOB DYLAN CONCORDANCE (THE), by Steve Michel. 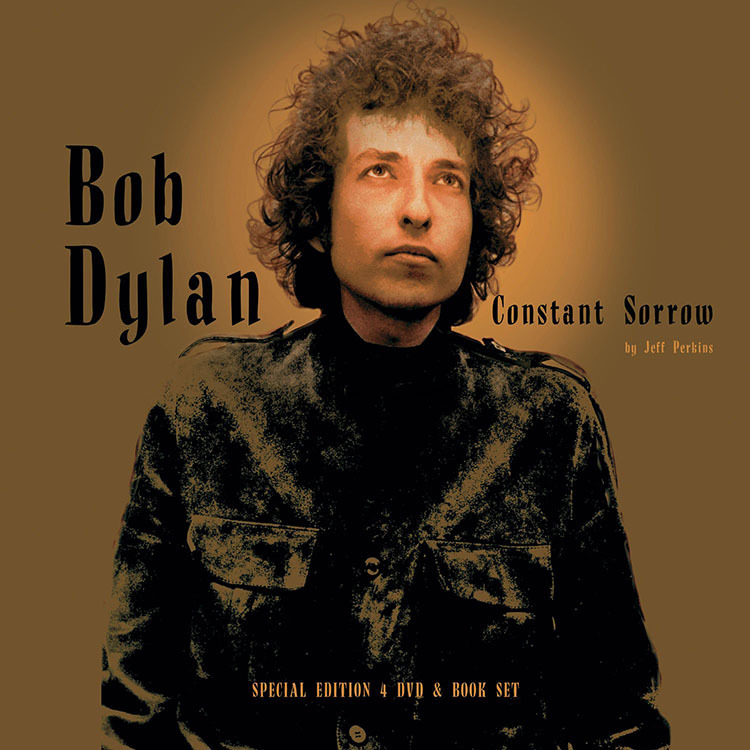 BOB DYLAN - CONSTANT SORROW, by Jeff Perkins. 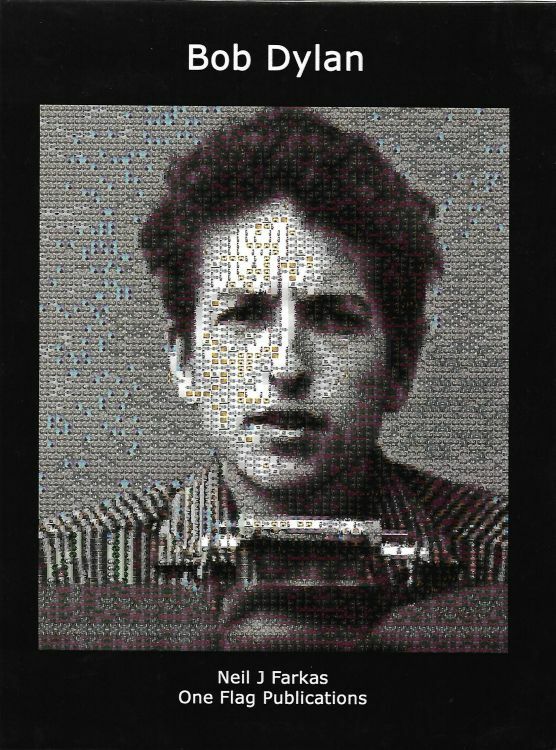 BOB DYLAN COVER-VERSIONS, by Gerhard Jansen. 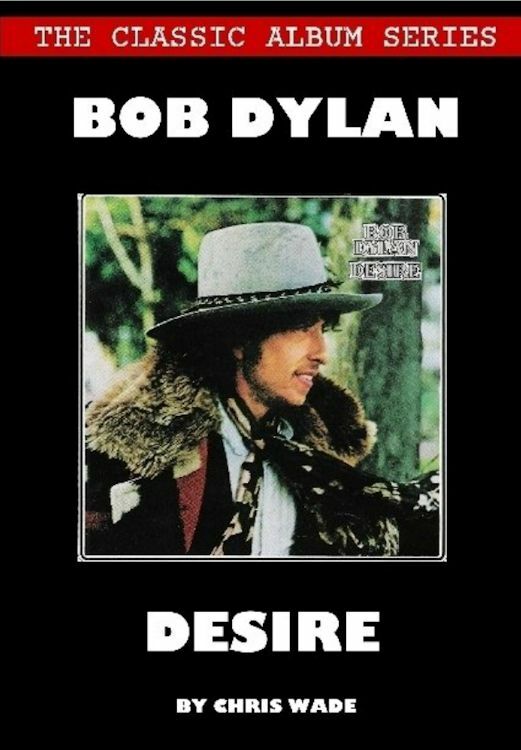 BOB DYLAN DESIRE, by Chris Wade. 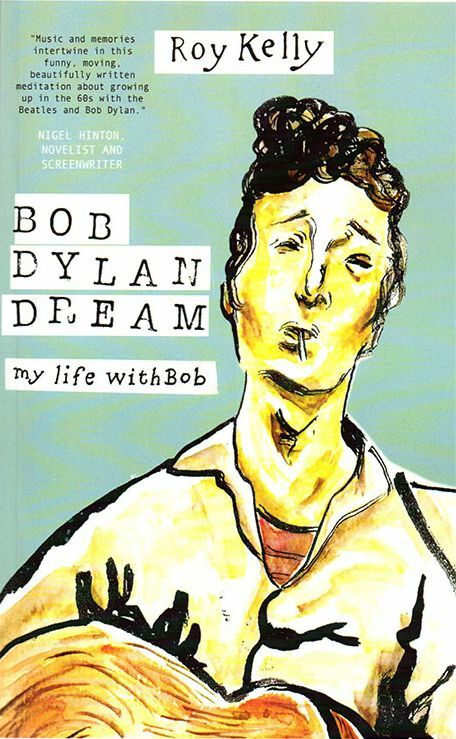 BOB DYLAN DREAM - MY LIFE WITH BOB, by Roy Kelly. 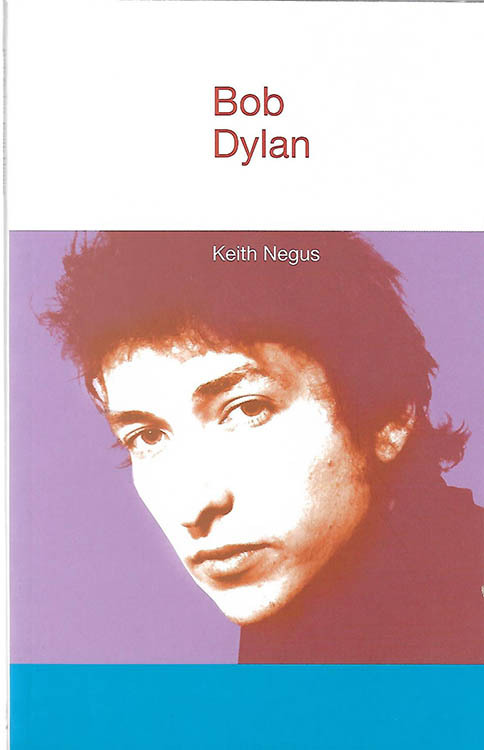 BOB DYLAN - EVERYTHING YOU NEED TO KNOW, by Kenneth Marshall. 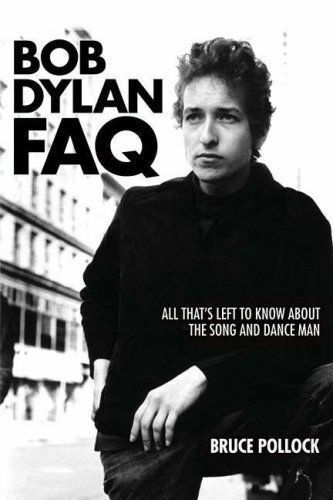 BOB DYLAN FAQ, by Bruce Pollock. 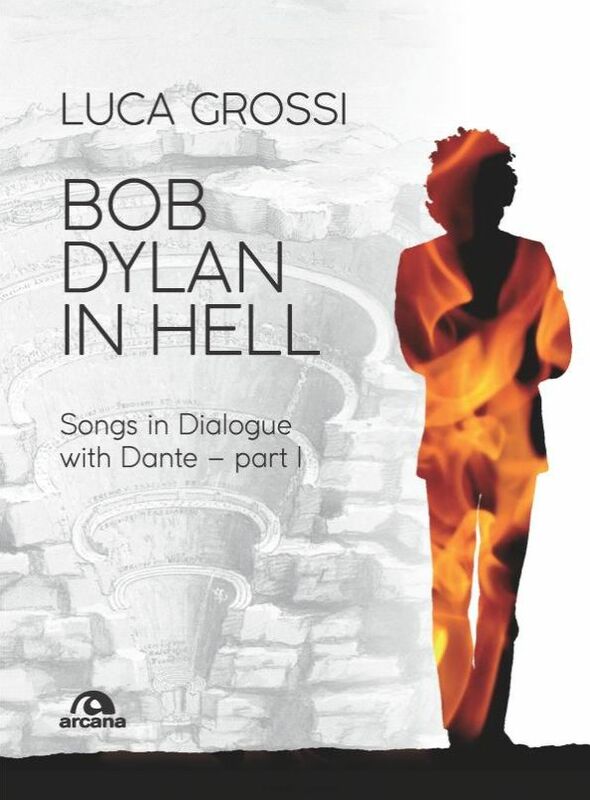 BOB DYLAN IN HELL, by Luca Grossi. 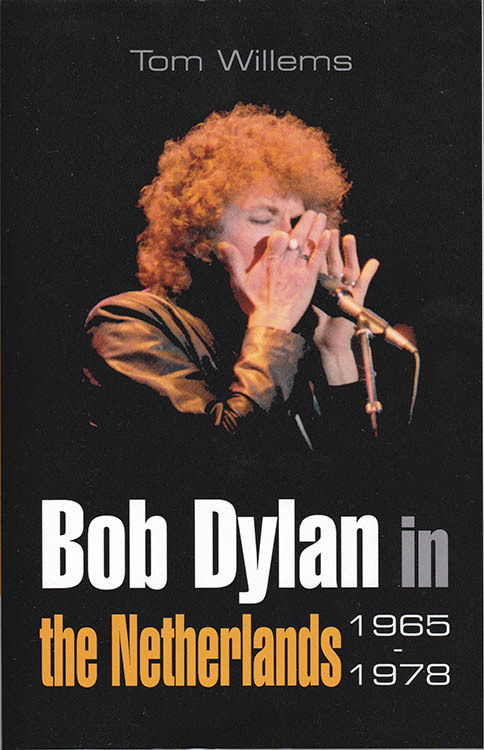 BOB DYLAN IN PERFORMANCE - A FILMOGRAPHY 1962-1987, by Anders Lindh. 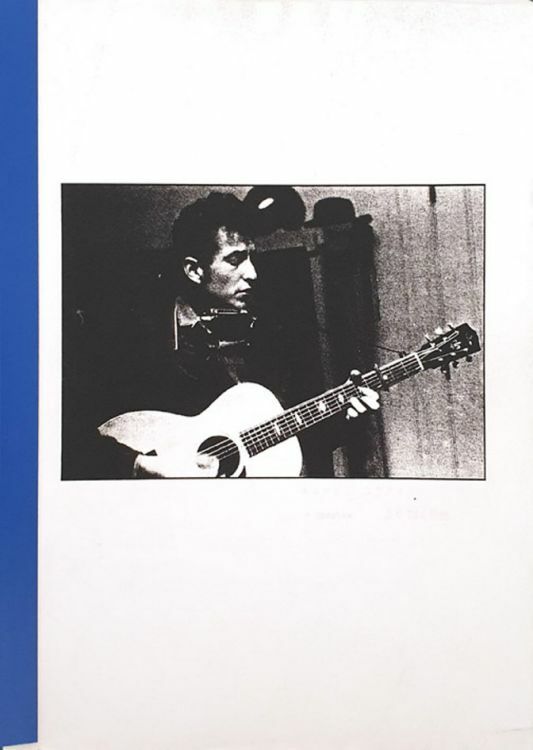 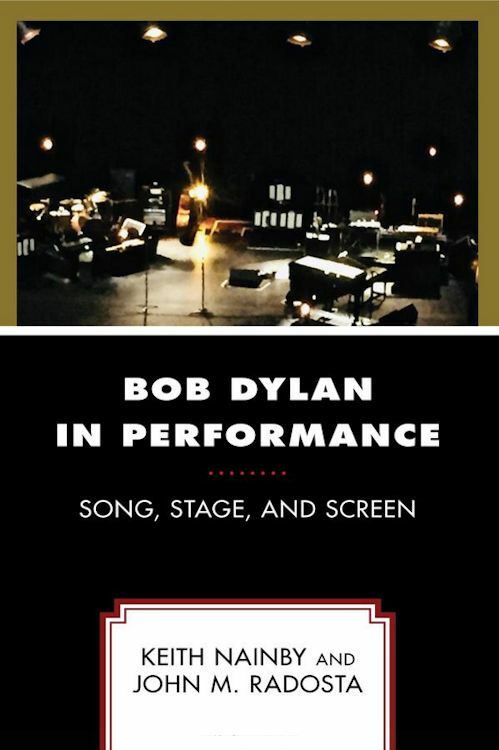 BOB DYLAN IN PERFORMANCE - SONG, STAGE AND SCREEN, by Keith Nainby and John M. Radosta. 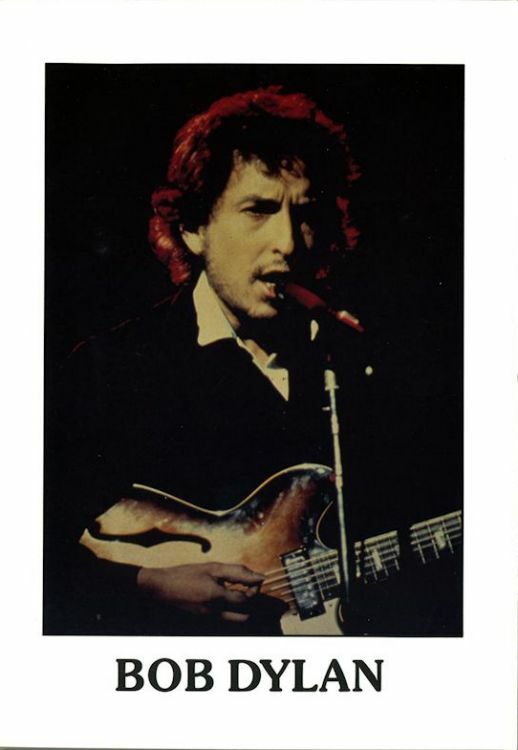 BOB DYLAN IN THE 1980's, by Chris Wade. 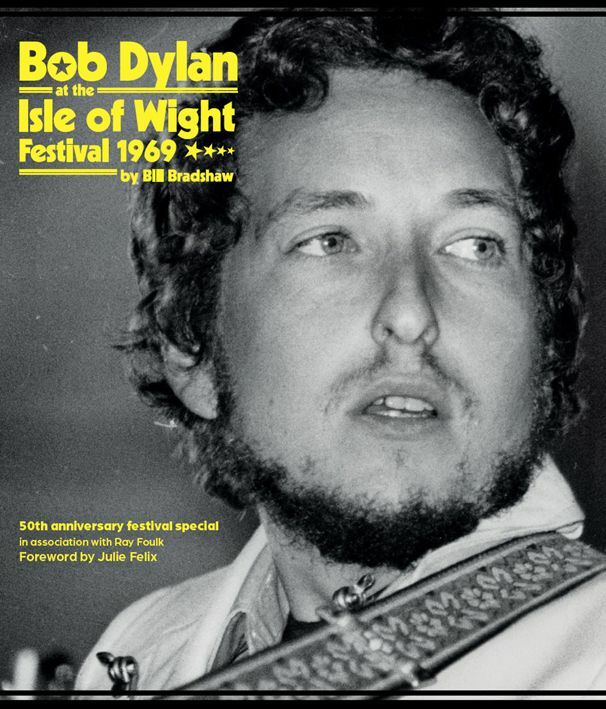 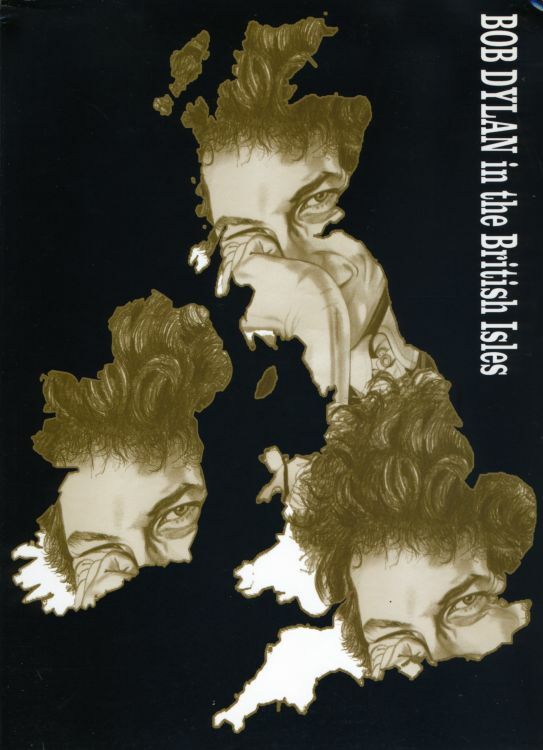 BOB DYLAN IN THE BRITISH ISLES, by Steve Butterworth. 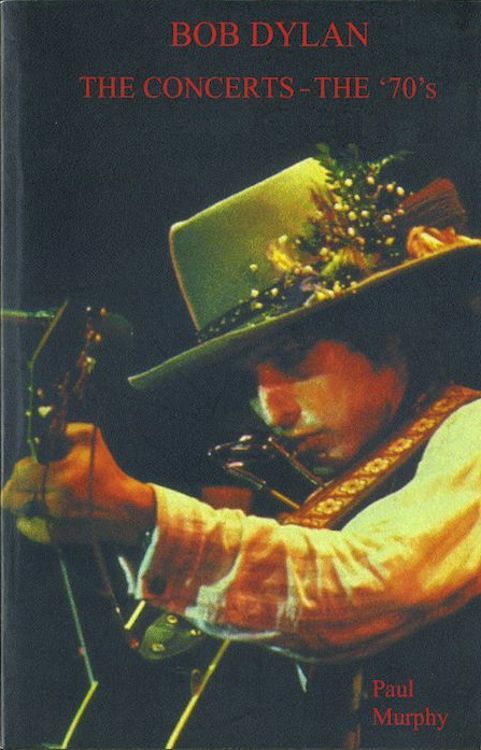 BOB DYLAN IN THE NETHERLANDS 1965-1978, by Tom Willems. 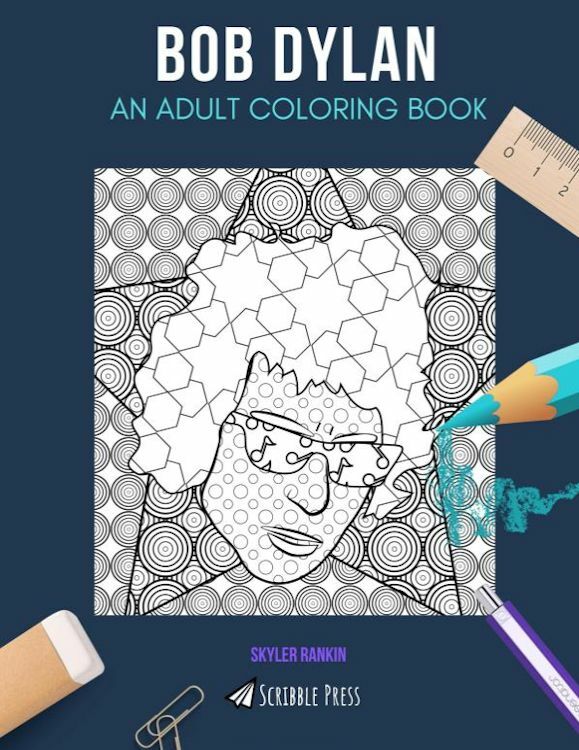 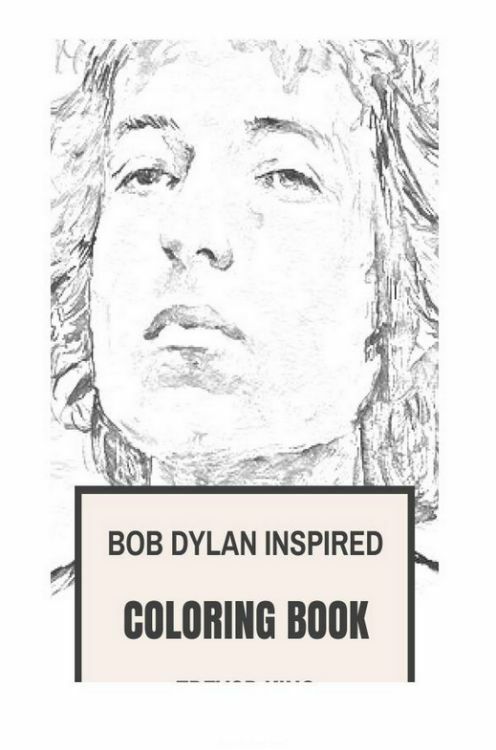 BOB DYLAN INSPIRED - COLORING BOOK, by Trevor King. 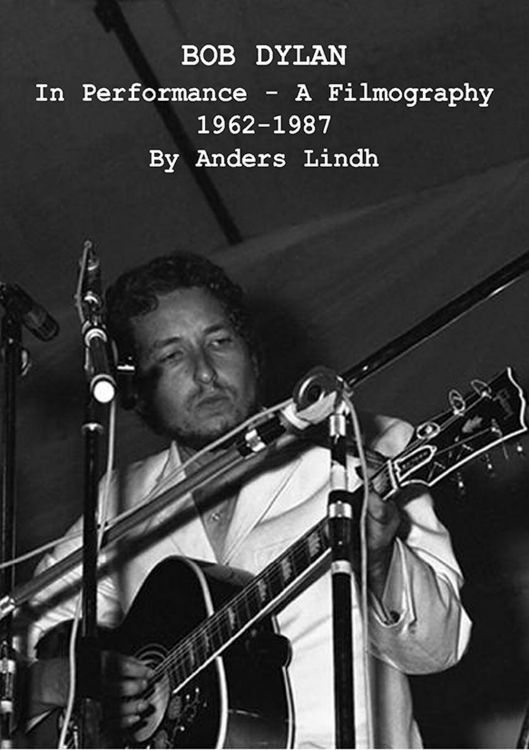 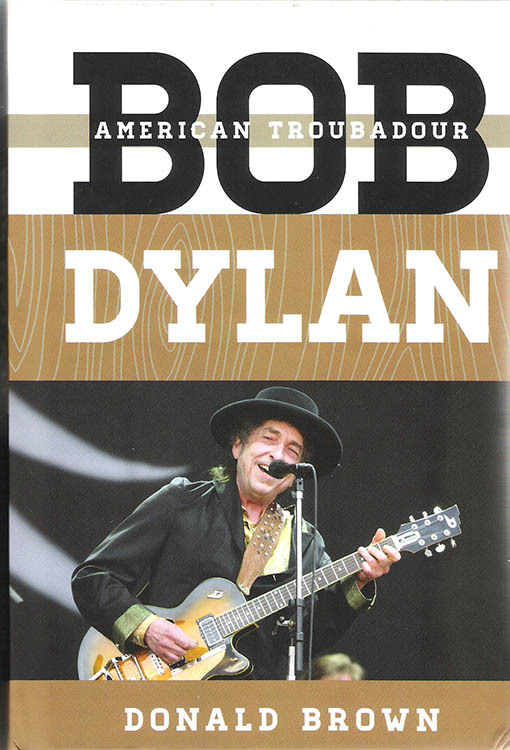 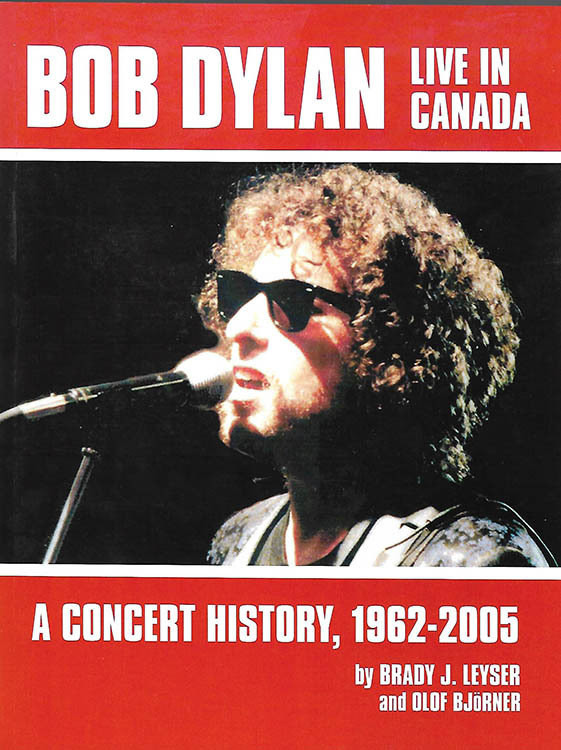 BOB DYLAN LIVE IN CANADA, A CONCERT HISTORY 1962-2005, by Brady J. Leyser and Olof Bj�rner. 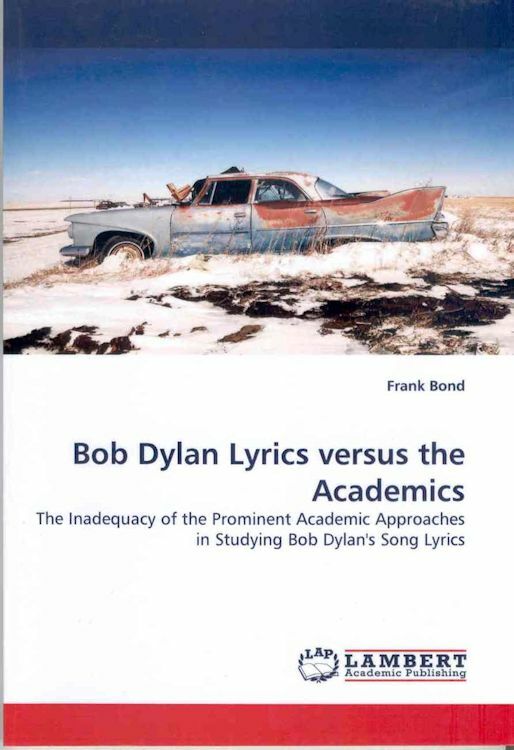 BOB DYLAN LYRICS VERSUS THE ACADEMICS, by Frank Bond. 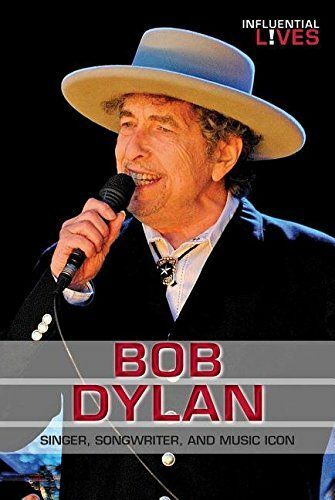 BOB DYLAN - MR. TAMBOURINE MAN, by various authors. 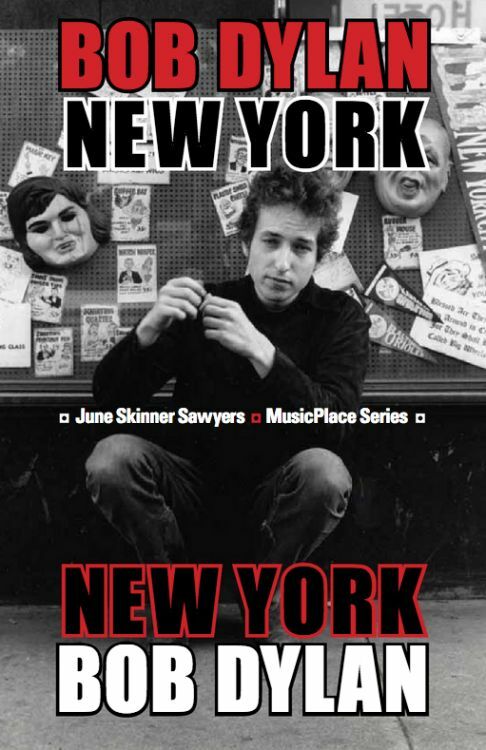 BOB DYLAN NEW YORK / NEW YORK BOB DYLAN, by June Skinner Sawyers. 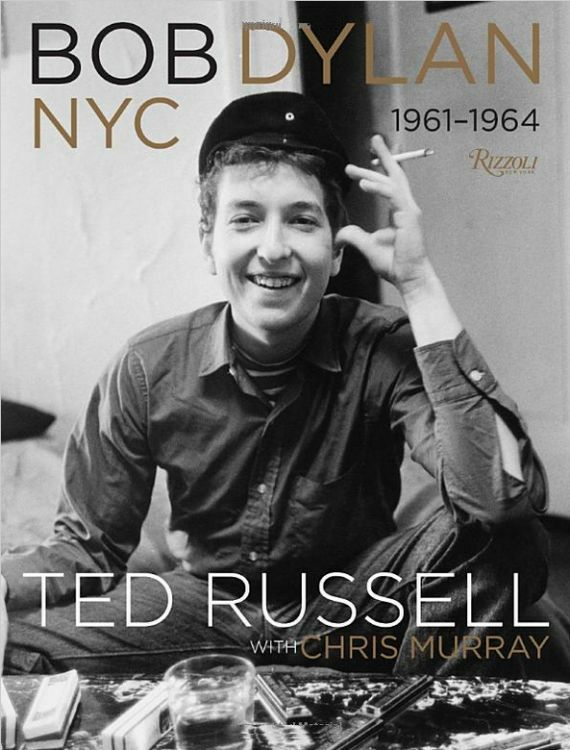 BOB DYLAN - NYC 1961-1964, by Chris Murray (text) and Ted Russell (photographs). 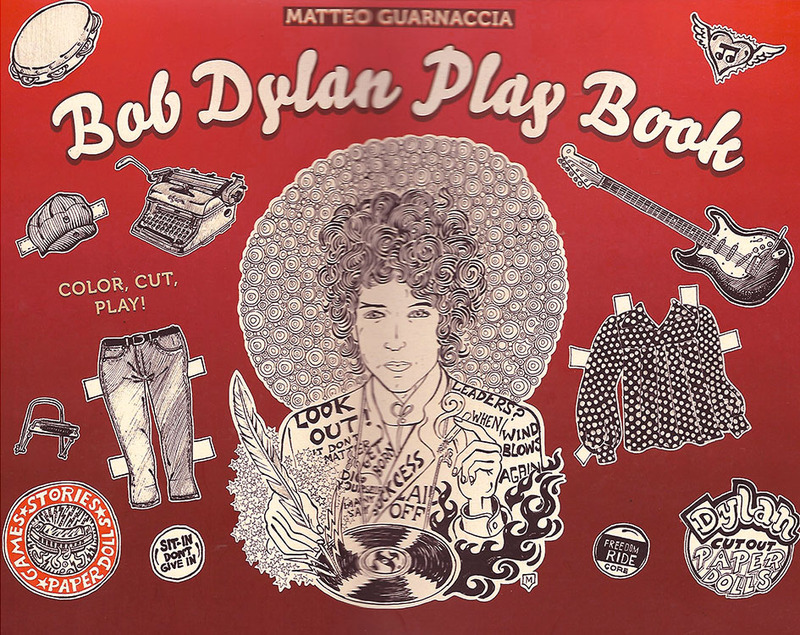 BOB DYLAN PLAY BOOK - COLOR, CUT, PLAY!, by Matteo Guarnaccia. 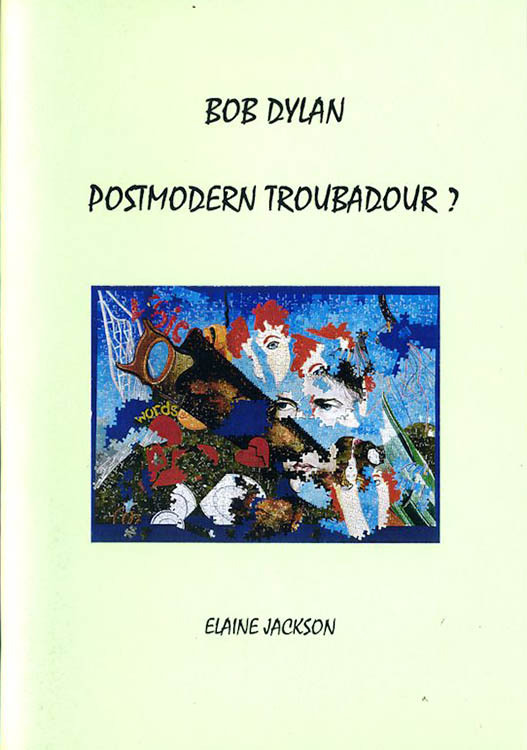 BOB DYLAN POSTMODERN TROUBADOUR?, by Elaine Jackson. 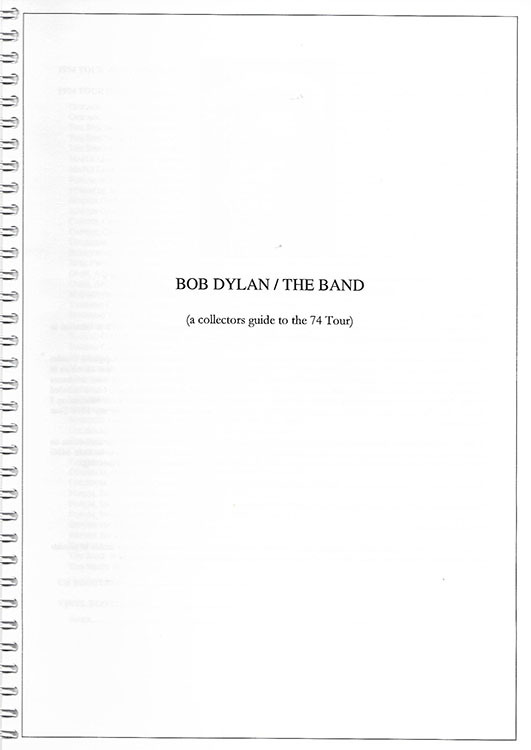 BOB DYLAN / THE BAND -(A COLLECTOR'S GUIDE TO THE 74 TOUR), by Les Kokay. 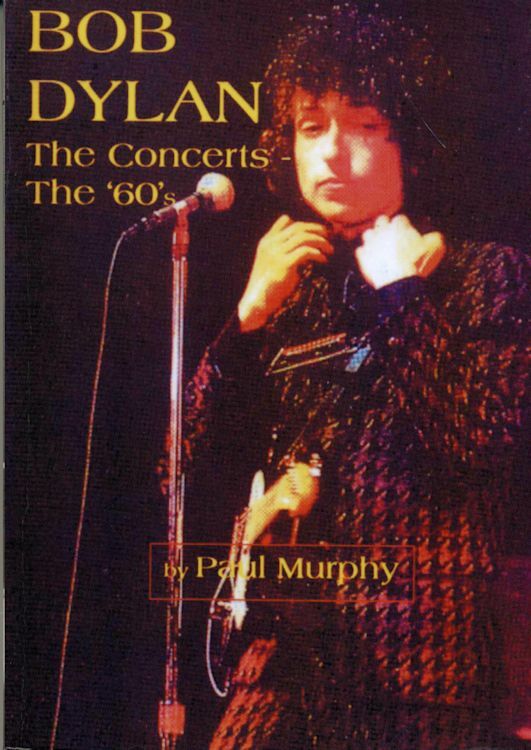 BOB DYLAN - THE CONCERTS - THE 60's, by Paul Murphy. 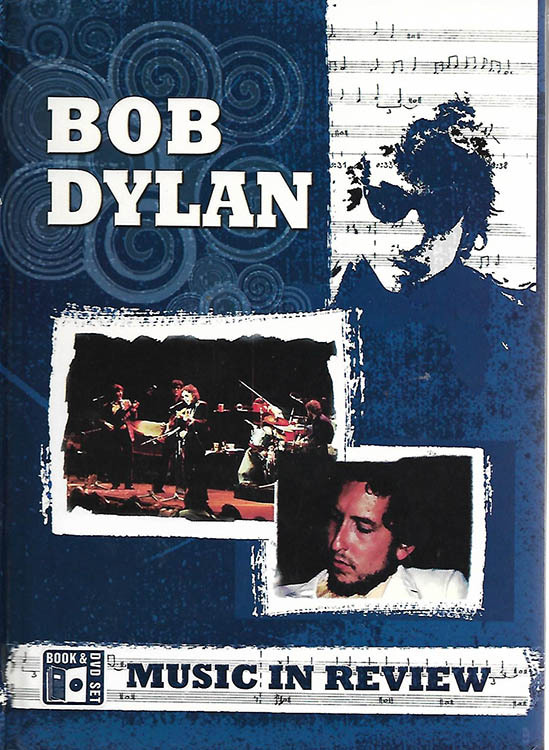 BOB DYLAN - THE CONCERTS - THE 70's, by Paul Murphy. 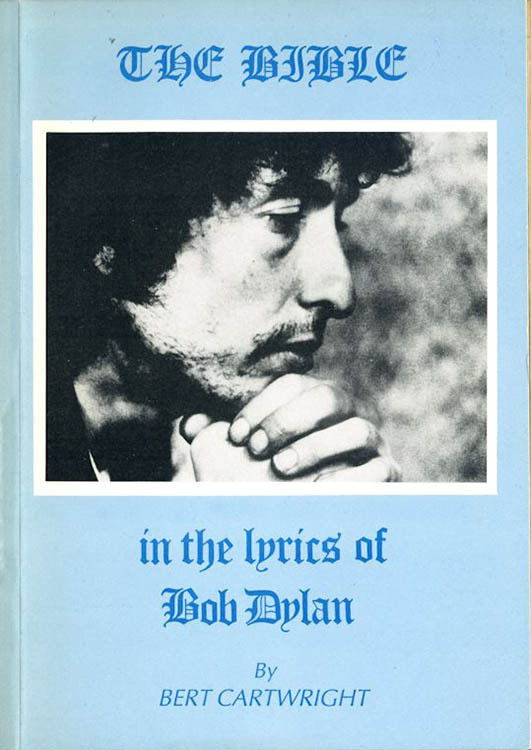 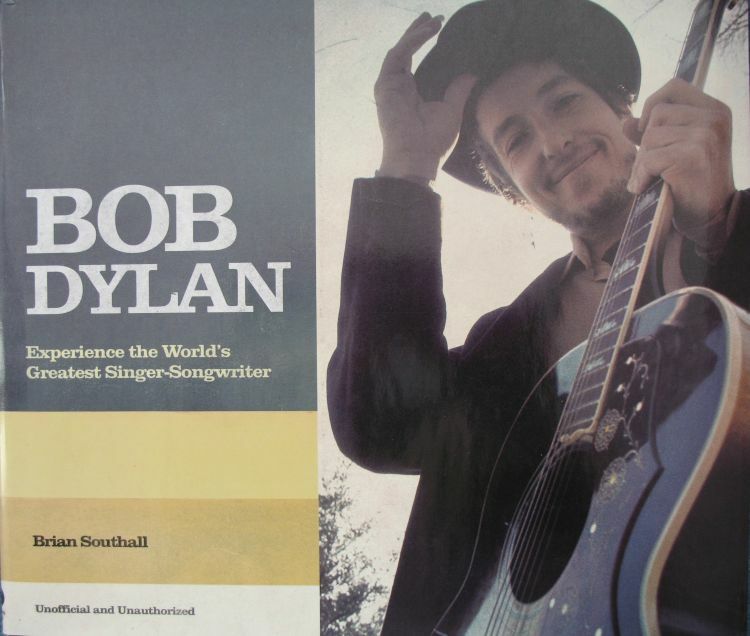 BOB DYLAN - THE FOLIO OF LYRICS, A Snide Production. 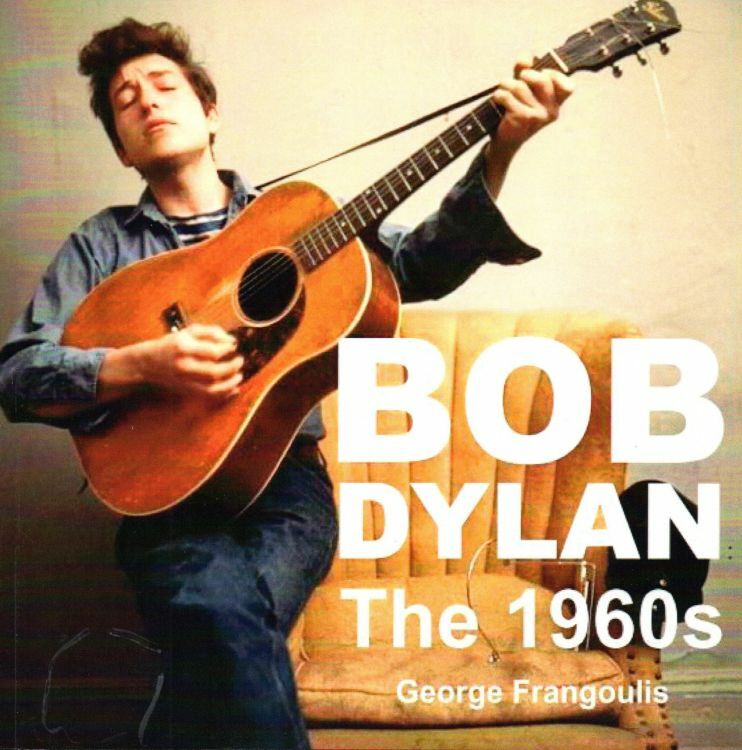 BOB DYLAN - THE 1960s, by George Frangoulis. 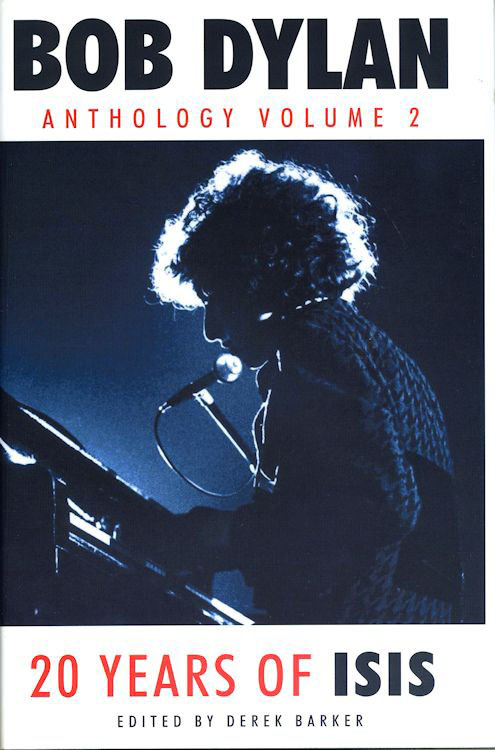 BOB DYLAN - THE SPIRIT AND THE LETTER, by Z.W. 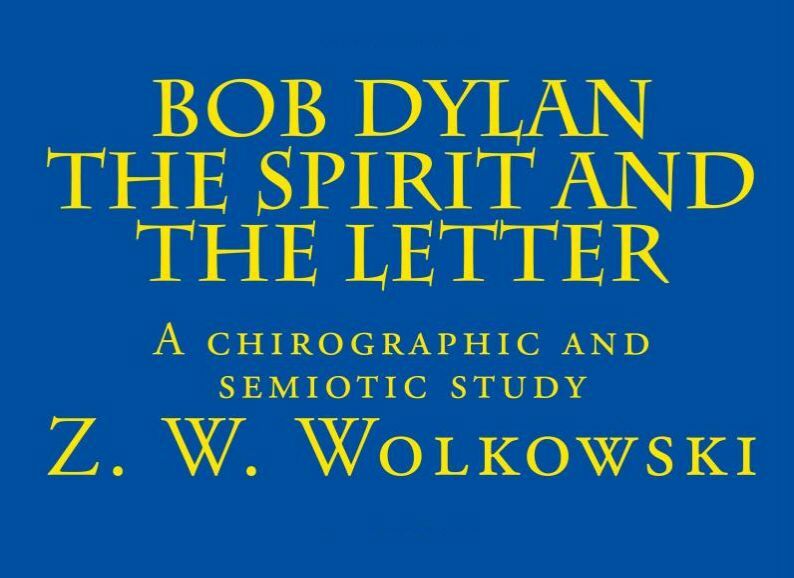 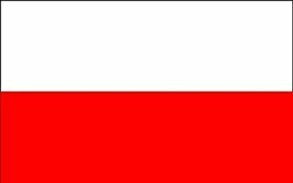 Wolkowski. 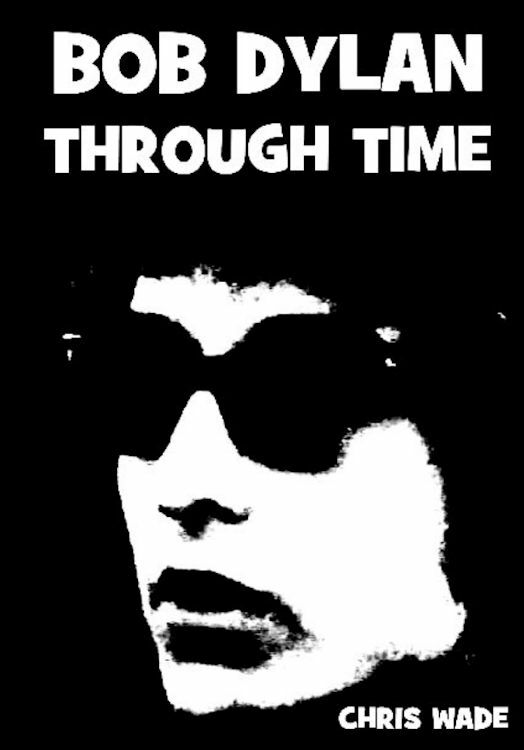 BOB DYLAN THROUGH TIME, by Chris Wade. 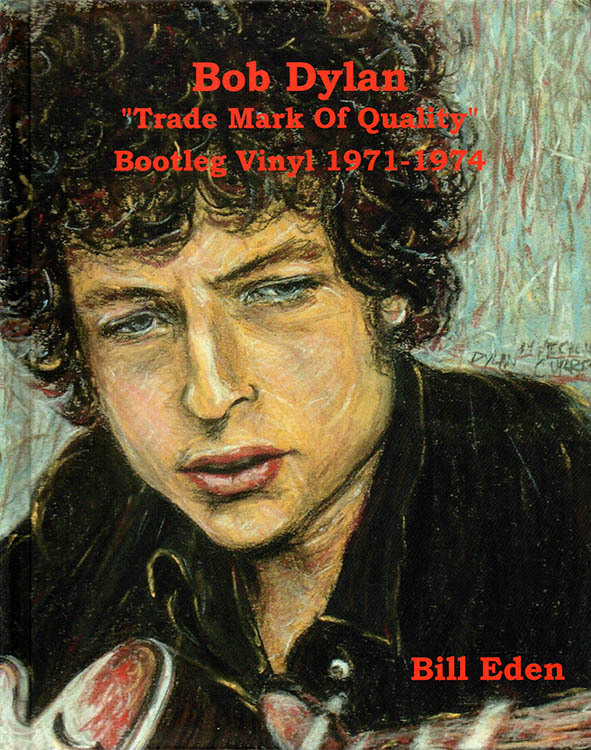 BOB DYLAN "TRADE MARK OF QUALITY", BOOTLEG VINYL 1971-1974, by Bill Eden. 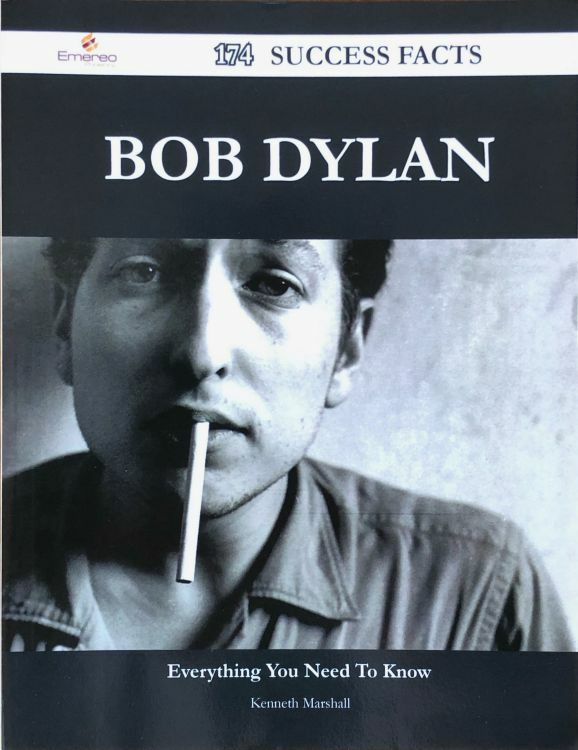 BOB DYLAN UNSCRIPTED, by Douglas R. Gilbert. 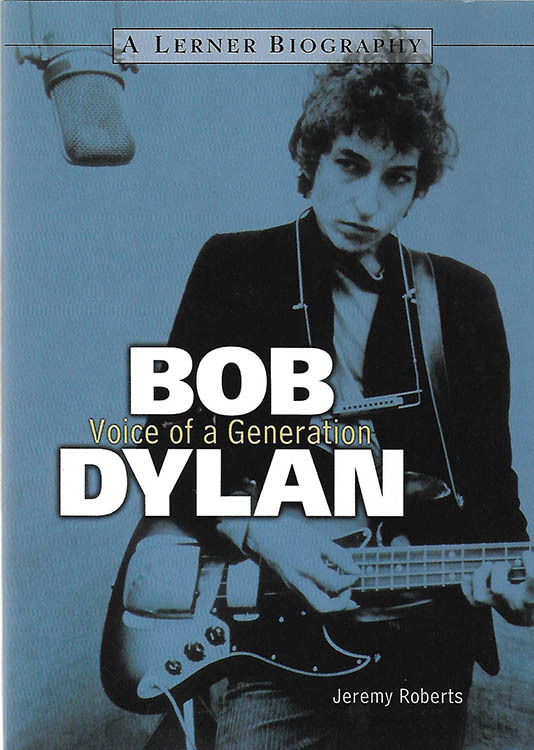 BOB DYLAN VOICE OF A GENERATION, by Jeremy Roberts. 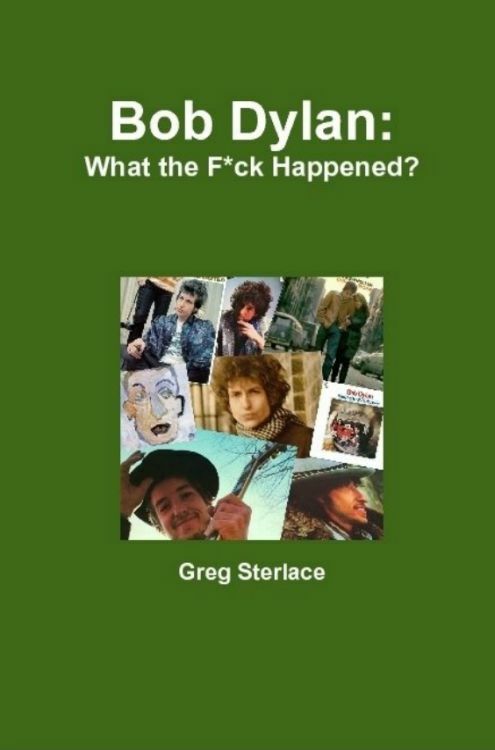 BOB DYLAN: WHAT THE F* CK HAPPENED?, by Greg Sterlace. 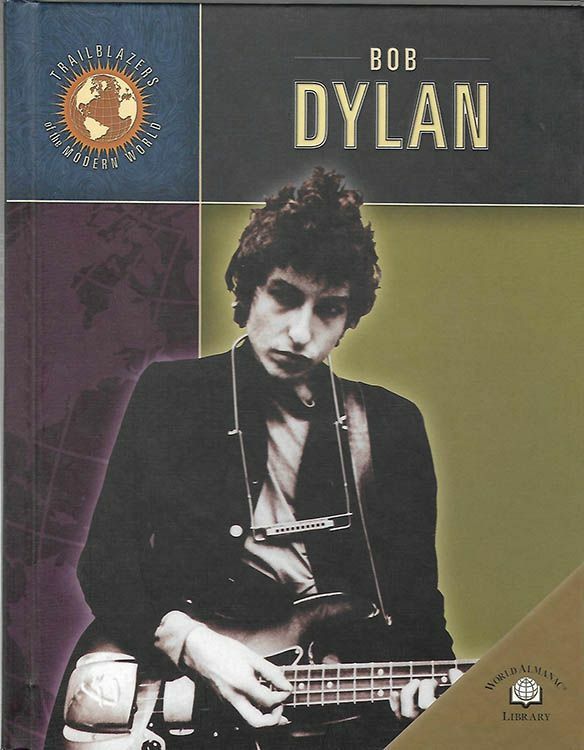 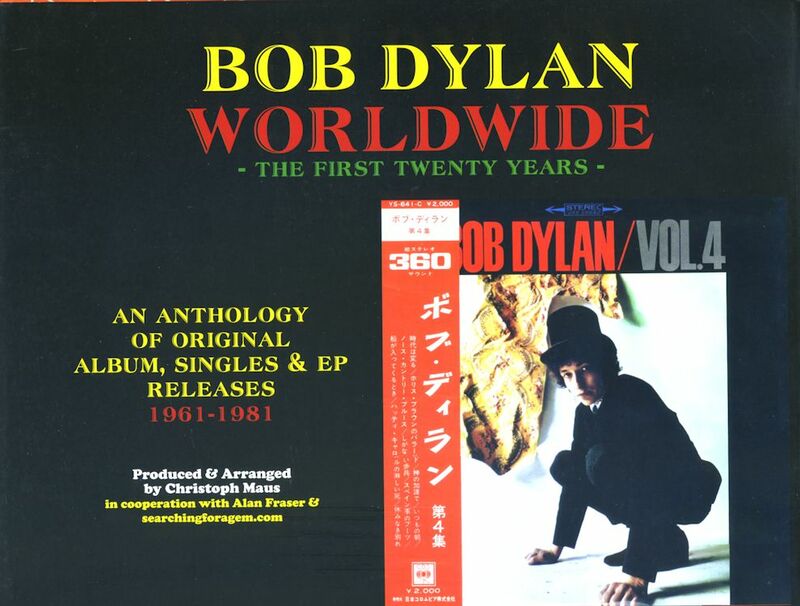 BOB DYLAN WORLDWIDE - THE FIRST TWENTY YEARS by Christoph Maus. 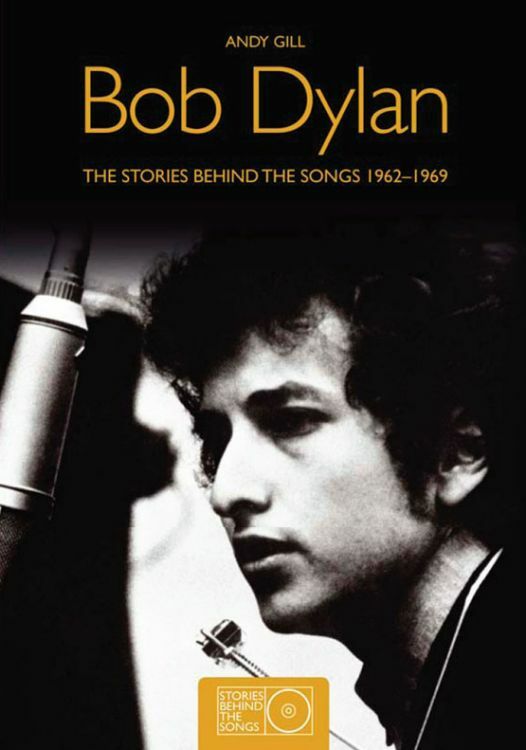 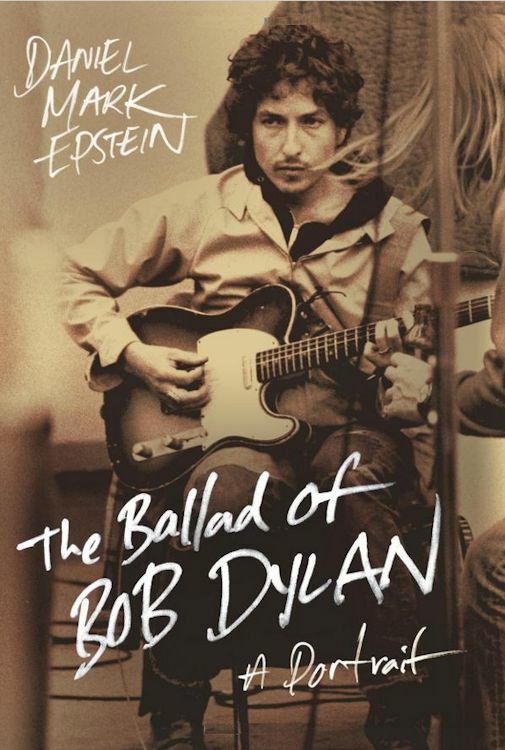 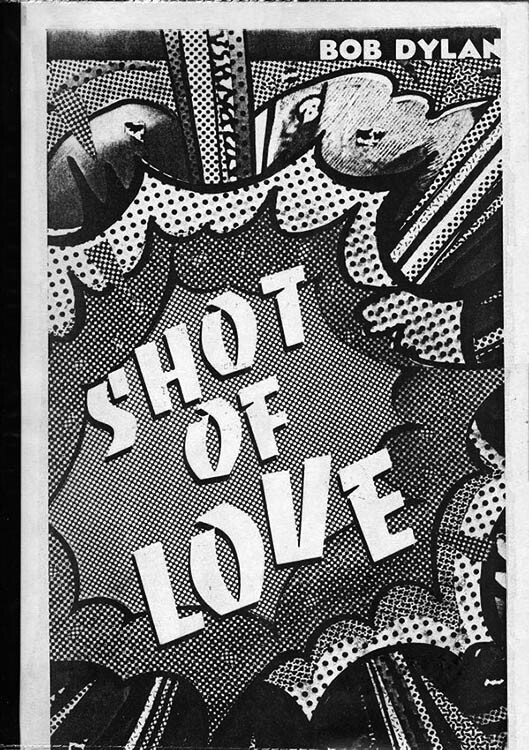 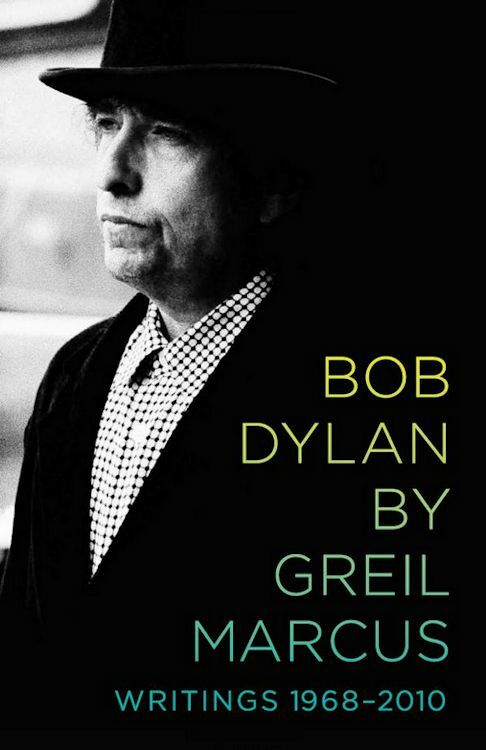 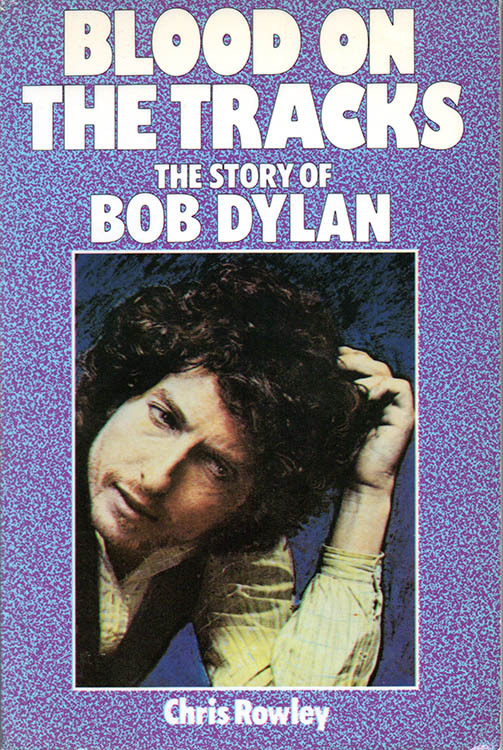 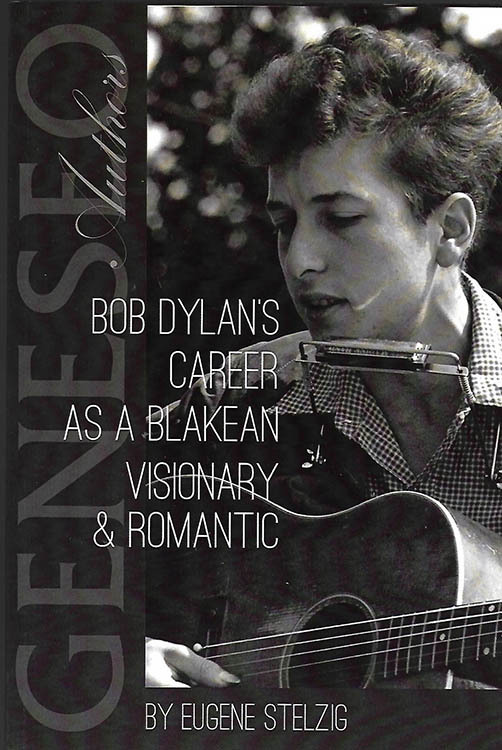 BOB DYLAN�S CAREER AS A BLAKEAN VISIONARY & ROMANTIC, by Eugene Stelzig. 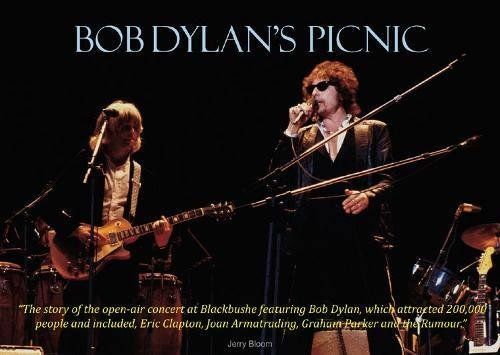 BOB DYLAN'S PICNIC, by Jerry Bloom. 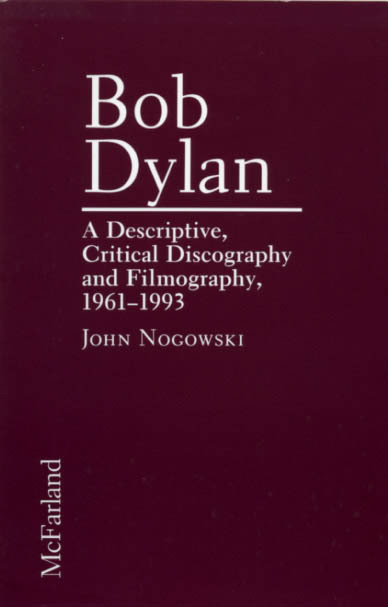 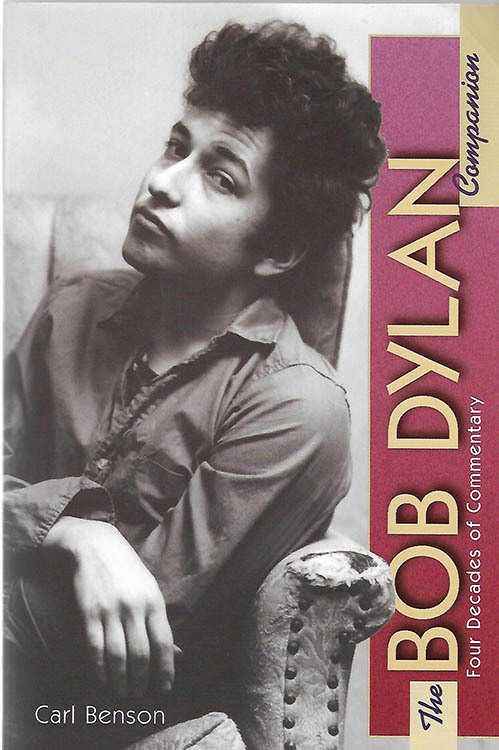 BOB DYLAN'S WORDS - A CRITICAL DICTIONARY AND COMMENTARY By Richard David Wissolik and Scott McGrath. 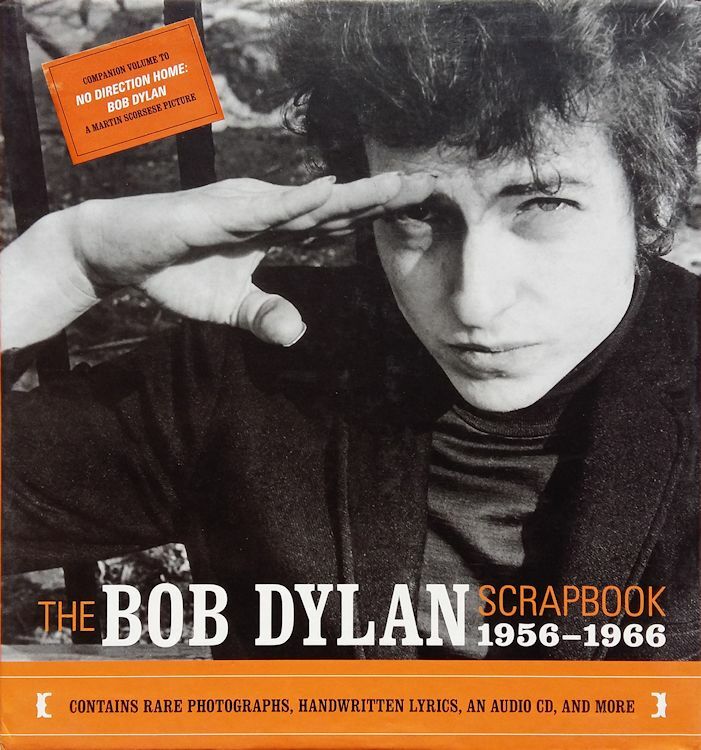 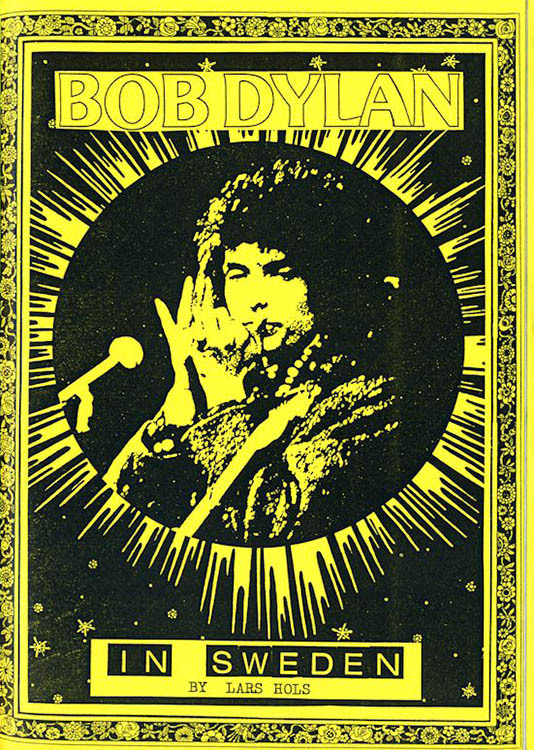 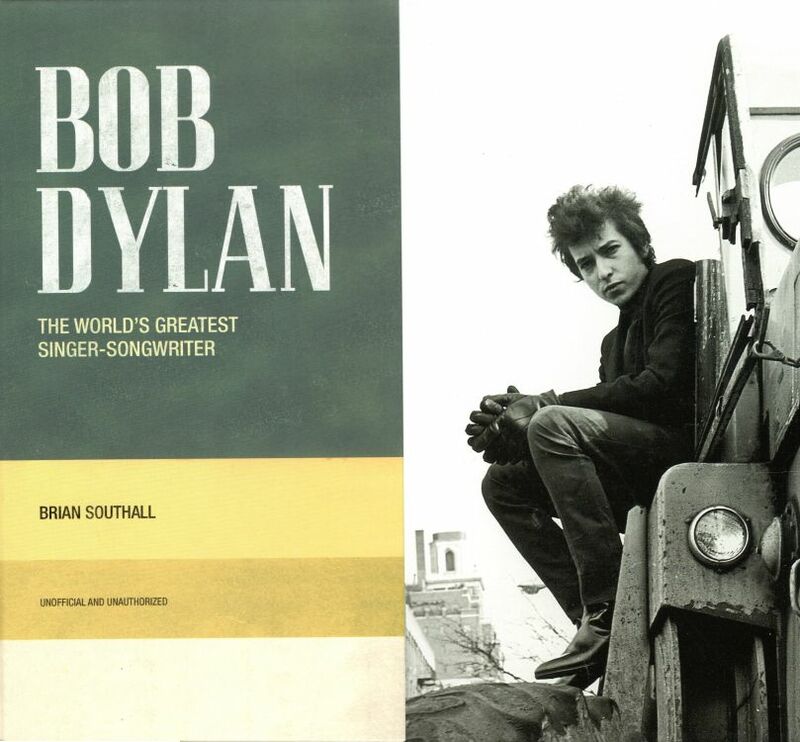 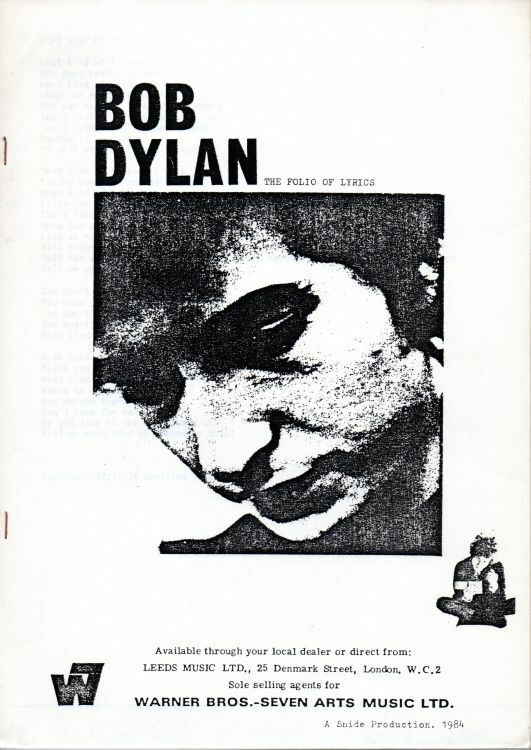 BOOTLEG SERIES (THE), the books and booklets included in the box sets. 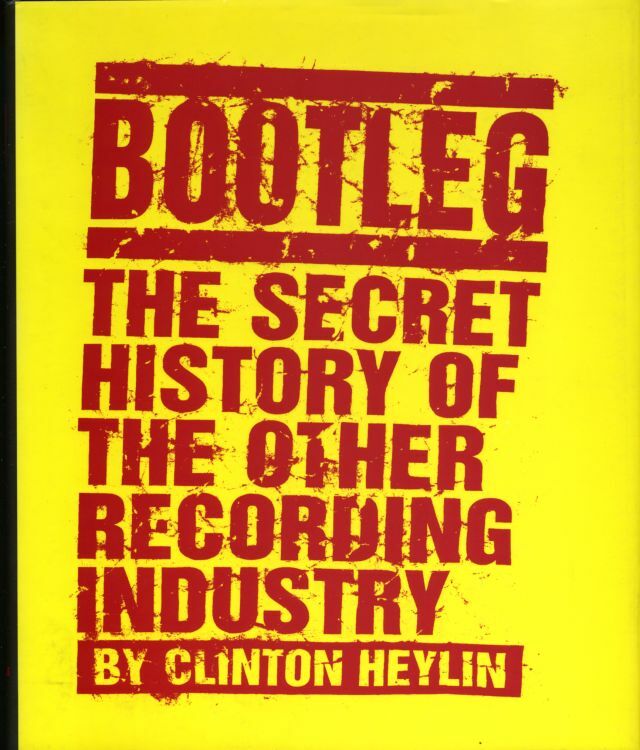 * BOOTLEG - THE SECRET HISTORY OF THE OTHER RECORDING INDUSTRY, by Clynton Heylin. 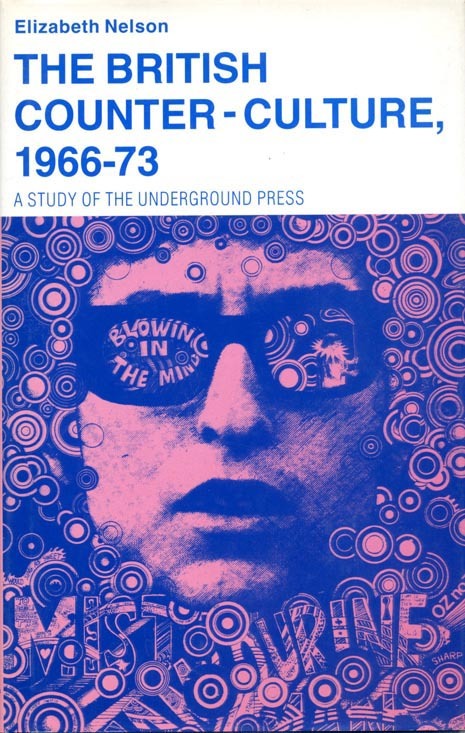 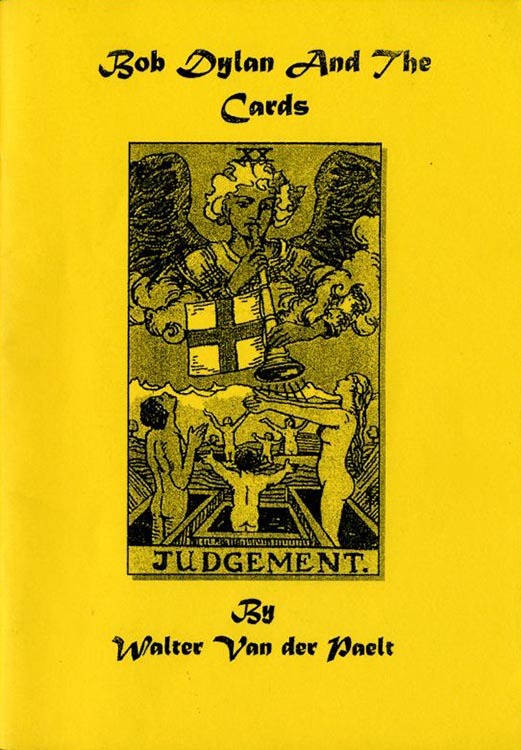 * BRITISH COUNTER-CULTURE, 1966-73 (THE), by Elisabeth Nelson.